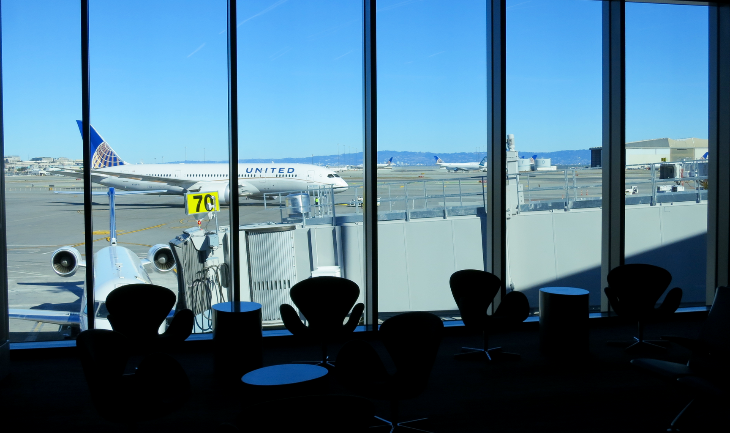 United Club members or MileagePlus Gold+ members accustomed to using the United Club just past security in SFO’s International Terminal G will have to change their plans for a while. Unless of course they are flying on a paid business or first class ticket. 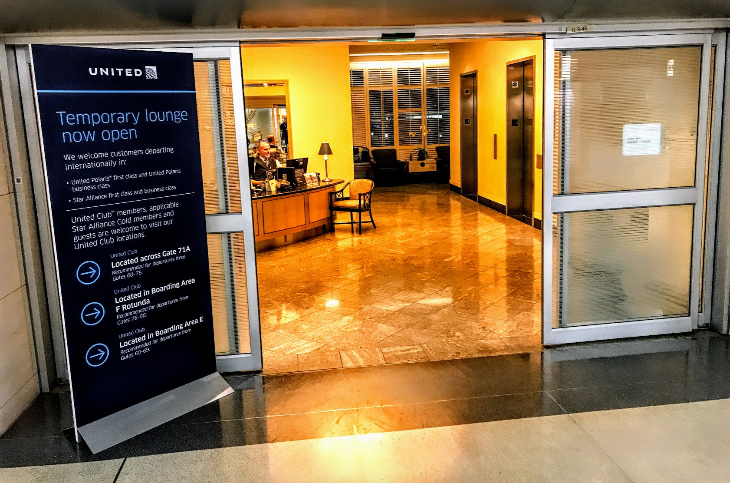 That lounge, near Gate G92, has been closed as United proceeds with construction that will convert that space into a new Polaris Club for premium-class international travelers. 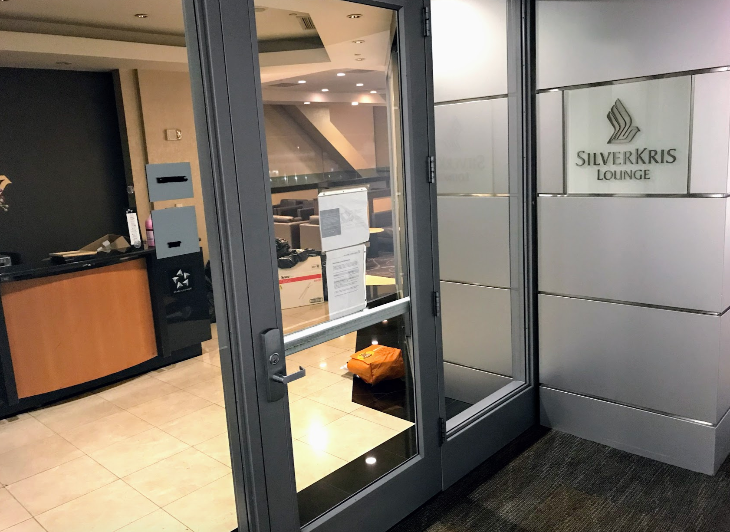 The adjacent Singapore Air Silver Kris lounge, which will become part of the newer, larger Polaris lounge, has closed as well. United says that the new facility should be ready by next summer (2018). In the meantime, the old Global First Lounge in the International Terminal (way out near gate G98) is serving as a temporary lounge for United Polaris first and business class departing customers and Star Alliance international first and business class departing customers (including United). 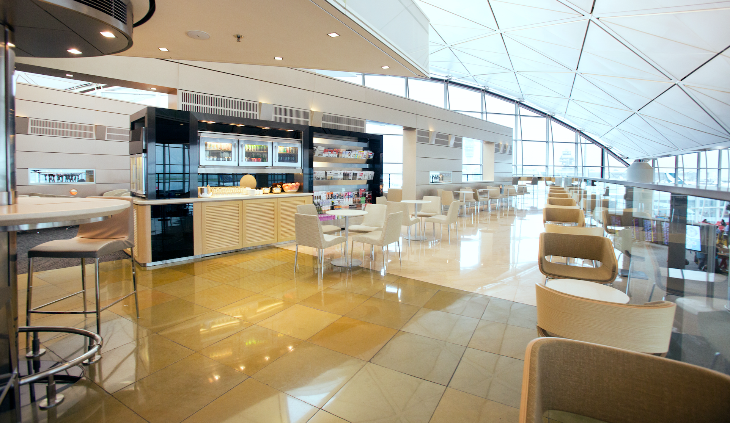 For the time being, Star Alliance Gold and United Club members will have to schlep back to any of the three United Club locations in Terminal 3 via the post-security walkway that connects the International Terminal and Terminal 3. To handle the increased traffic, United has re-opened another club across from Gate 71A on the mezzanine level (take elevator) above the main concourse. Customers should plan on a 5-10 minute walk in each direction. Here’s a look at the mezzanine United Club when it opened in 2014-2016. 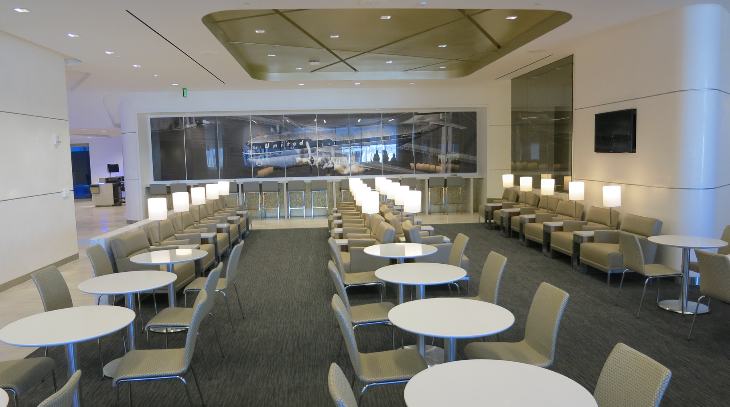 The SFO construction is just one of several United Club improvement projects around United’s system. At Newark, part of the United Club near Gate C120 in Terminal C is being converted to a new Polaris Lounge, so seating in that lounge is “significantly limited” for now. 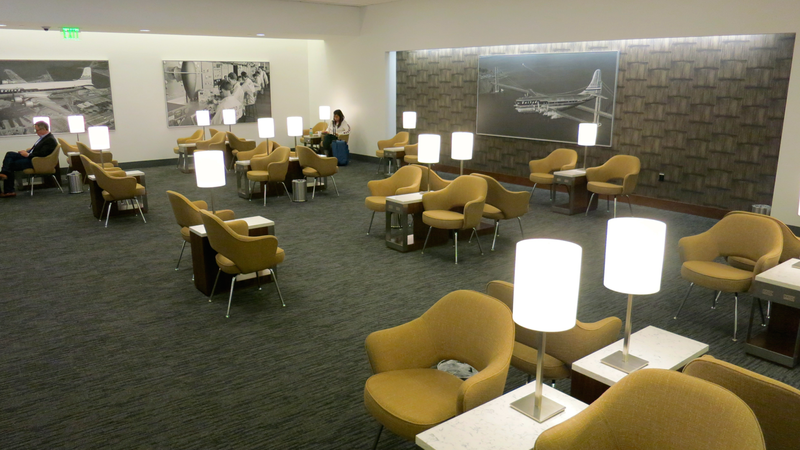 At Houston Bush Intercontinental, the United Club in Terminal E is due to reopen this month after a renovation project. At Chicago O’Hare, the Club near Gate C16 in Terminal 1 is closed for renovations until sometime this winter. And the United Club at Ft. Lauderdale is closed for an overhaul, although United has opened a temporary location in Terminal 1 between Gates C1-C3. Here’s United’s latest list of United Club locations. 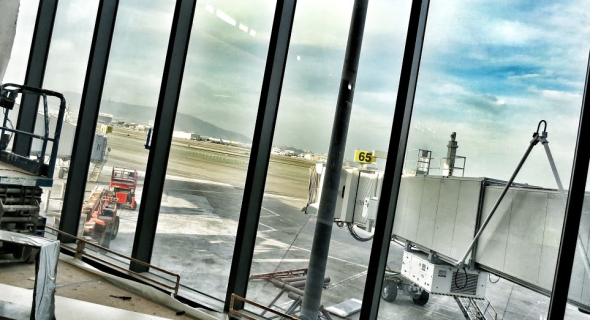 Are airport lounges getting too crowded? Frequent travelers love airport lounges, but do we love them too much? Maybe. 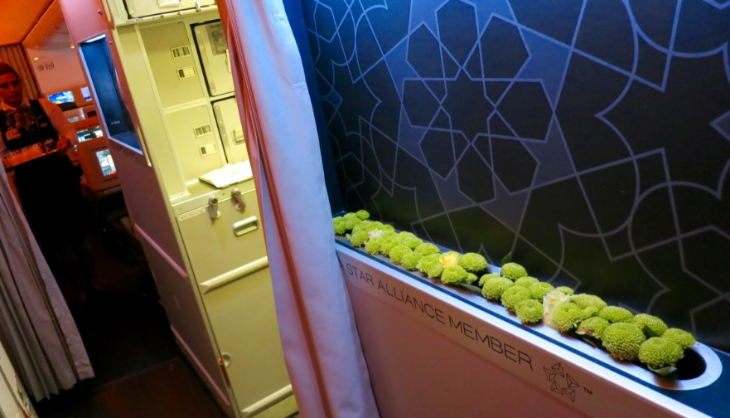 Overcrowding is becoming a serious issue in airline clubs- so much so that members are rethinking annual memberships, or considering newer options. 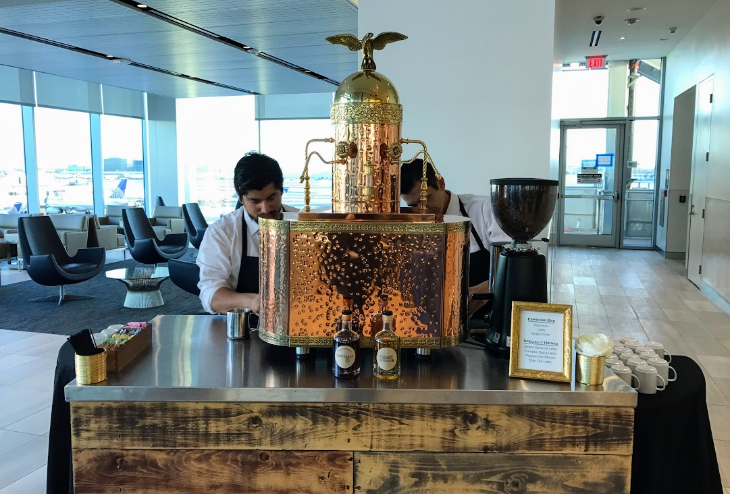 During busy morning hours, the United Clubs and the American Express Centurion Lounge my home airport (SFO) are frequently more crowded than airport terminals. Club staff have difficulty keeping buffets stocked and tables cleaned. Last time I was in New York-JFK, I had to squeeze onto a stool between two other travelers and peer out at the tarmac to mentally escape from the crazy-crowded Delta Sky Club where I’d just waited two-deep for a glass of chardonnay at the bar. 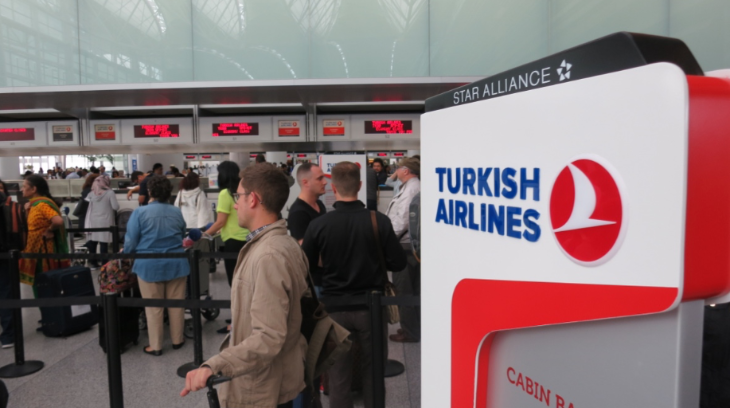 In Istanbul last May I saw business class passengers wait in bathroom lines for 10-20 minutes at Turkish Airlines’ massive (but crowded) business class lounge. When American Express announced that it was raising its annual fee for the Platinum Card from $450 to $550, I thought, “hmmm could Amex be taking a page from airline play books and jacking up fees to reduce crowding at Centurion Lounges?” Maybe. UPDATE: Amex has restricted the number of family members to two only. And then yesterday, I heard from a reader reporting that Alaska Airlines clubs at Sea-Tac were turning away Priority Pass cardholders due to capacity issues. At one time, high fees and lack of publicity kept most airline clubs cozy, quiet and comfortable refuges from crowded airport concourses. But that started to change a few years ago, when airlines began offering one-time passes for $50. Then credit card companies got in on the act, offering membership or day passes to card holders. That started to swell the ranks of club visitors. Then American Express saw a need for better airport lounges for its top tier Platinum and Centurion card members, and started to build lounges of its own. 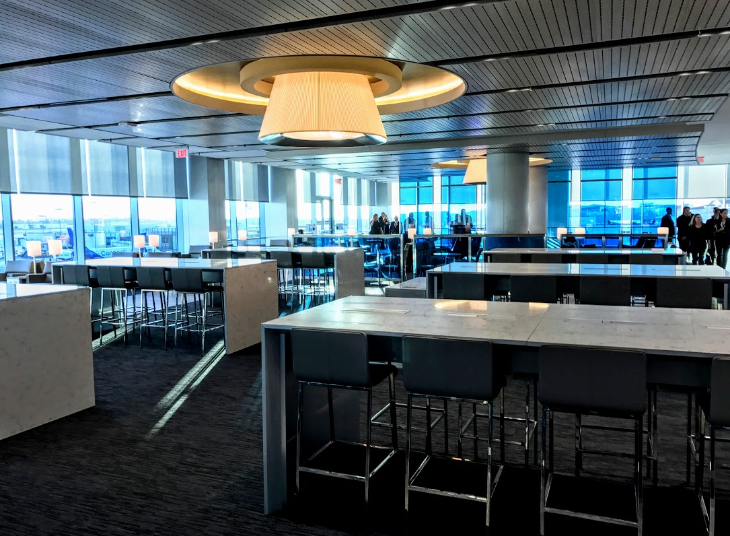 These Centurion lounges wowed members with chef-prepared meals, top-shelf bars, wine tastings, sophisticated design, and showers. The travel media fawned. But then Centurion lounges became overcrowded, too. 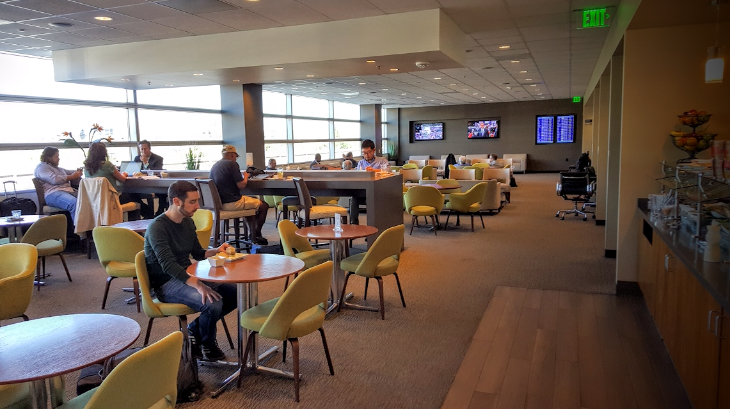 One solution to overcrowding has been the growth of airline agonistic lounges like The Club, which charges $40 per visit and has locations at 9 airports in the US. In my experience, these lounges are rarely crowded, and relatively nice. There are also Escape Lounges in the U.S. and the U.K.
Technology can also help. For example, the LoungeBuddy app helps travelers determine which lounges have availability, how much they cost and if they have a “pay as you go” option for as little as $25. Founder Tyler Dikman credits much of his company’s recent growth to travelers frustration with with crowding, which he says has become worse in the last three years. What about you? Have crowded conditions forced you to reconsider club memberships or credit cards offering lounge access as a perk? Please leave your comments below. United’s new Polaris concept will bring radical change to the airport lounge scene at San Francisco International over the next two years. 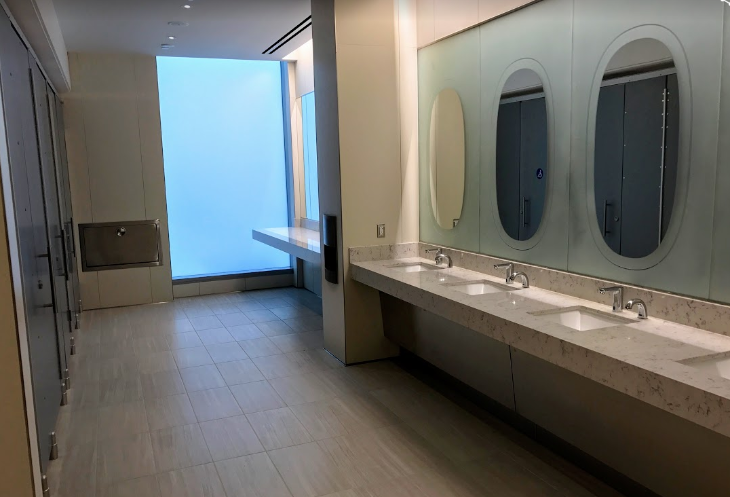 >The new United Polaris lounge at SFO will be located in the space now occupied by the existing United Club in Boarding Area G (near security) and will be one of the largest United Polaris lounges. 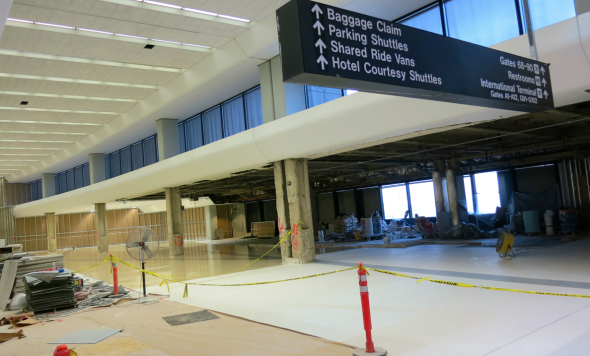 UPDATE: The new lounge is expected to open in late 2017 or early 2018 according to a United spokesperson. >Only customers traveling in United Polaris business class or United Polaris Global First on long-haul international flights, as well as customers traveling in international first or business class cabins on Star Alliance partner airlines will have access to the United Polaris lounge. This includes super elite Global Services members who are not flying business or first class- we asked United for clarification on this and they restated the strict policy: Customers ticketed for United Polaris business class or United Polaris first class, as well as customers traveling in international first or business class cabins on Star Alliance™ partner airlines will have access to the United Polaris lounges. Don’t miss! 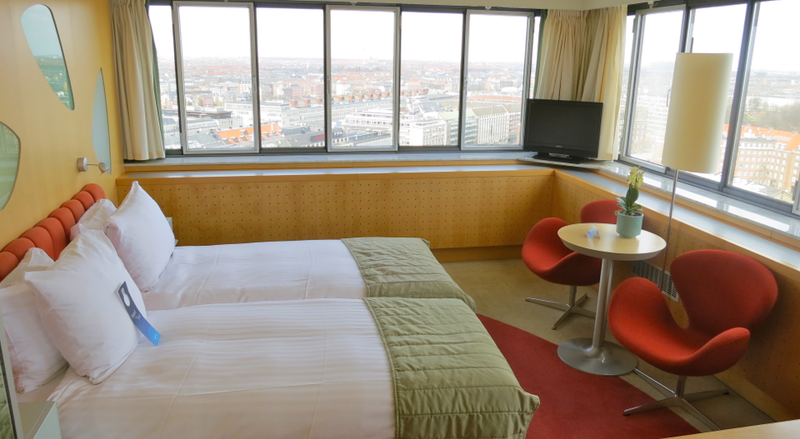 Details on Polaris lounge dining, sleeping rooms & more! So, what about United Club members who are not traveling in business or first class? Where will they lounge in Boarding Area G? 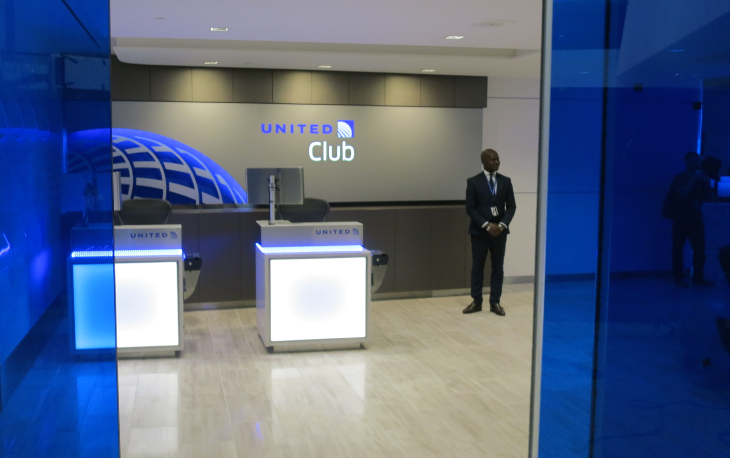 United’s got you covered with TWO new United Clubs located near gates 93 and 94. 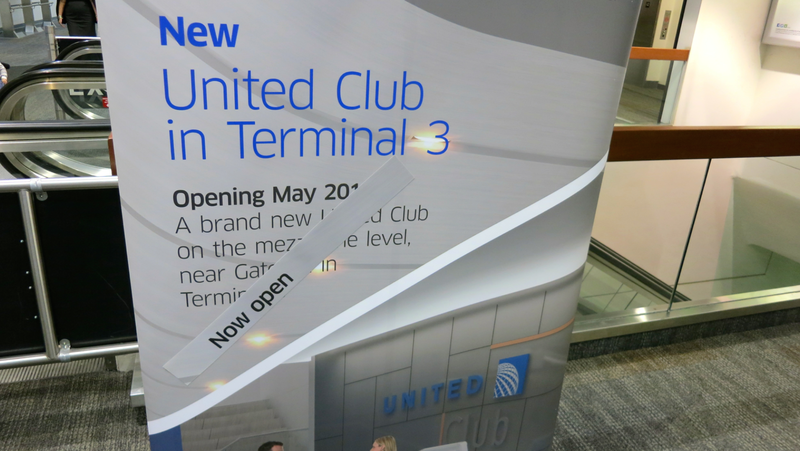 The first new United Club will open by Gate 93 in mid-2017. Although unconfirmed by United, I’m assuming the new space currently houses the rarely used #Converge@FlySFO meeting room- a relatively small room. But fear not small spaces! United will renovate the current Global First lounge (across the corridor by gate 94), convert it into a United Club by early 2018. After that, United will continue to operate both Clubs, according to a spokesperson. 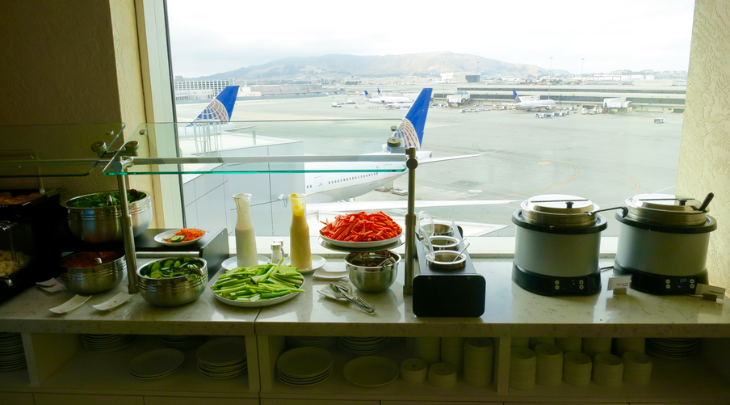 What else does United have planned for the SFO lounge scene? >While no hard date was provided, United says that the old-school United Club in Boarding Area F will be renovated as part of a larger renovation program for the terminal. 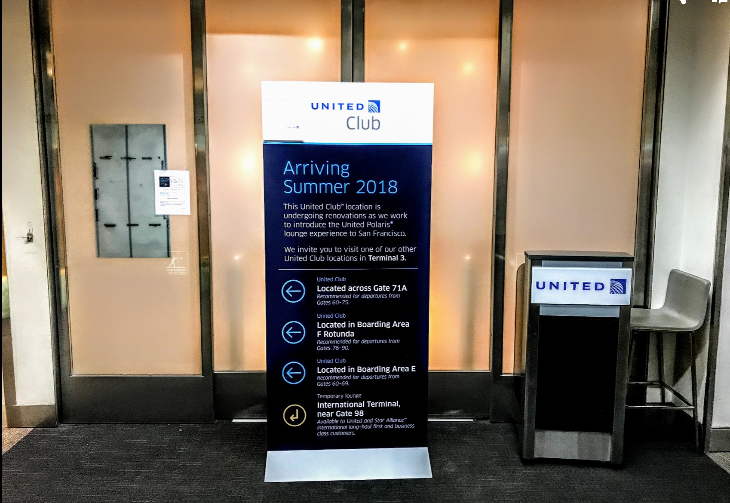 >United is looking at options for additional space for its newest United Club in Boarding Area E– which is a nice new addition (opened 2015), but is small and frequently overflowing. >United will continue to offer its arrivals lounge on the lower level on Concourse G.
Thoughts? Questions? Please leave ’em in the comments and we’ll try to elicit answers from United. 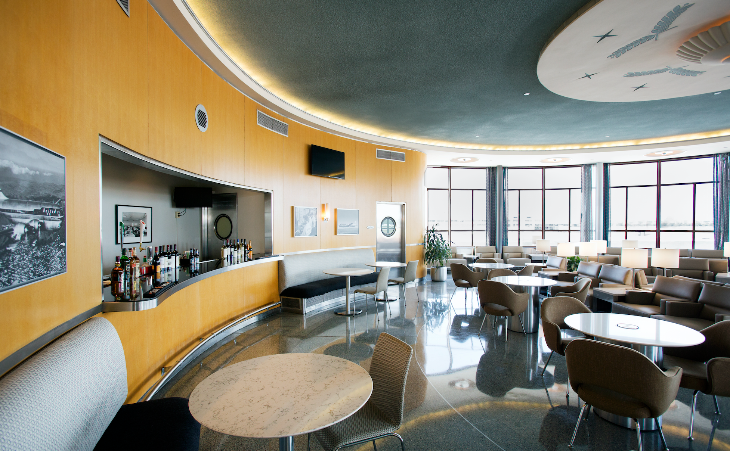 From a perch atop Terminal 7, the lounge offers sweeping views of the airport, the Hollywood Hills and the city skyline. Plus the new United Club features an outdoor terrace along with a big enhancement of food and beverage options for members. 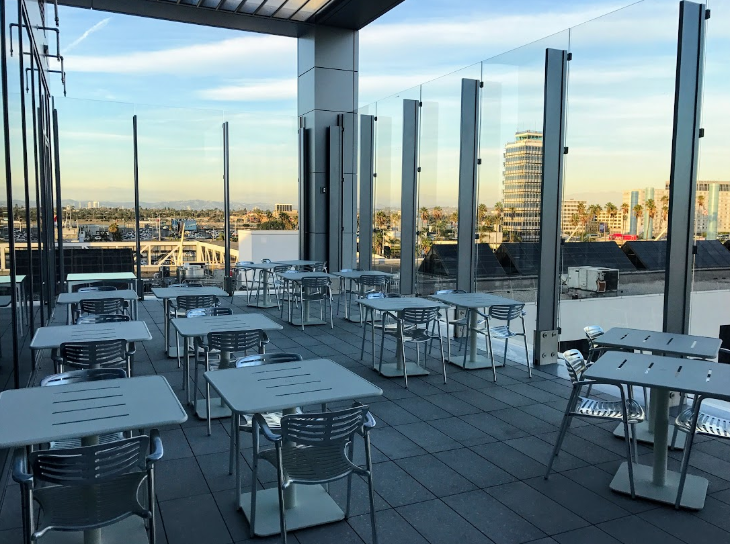 Members can take their drinks or meals onto the terrace to enjoy an alfresco experience- and oh, so LA. 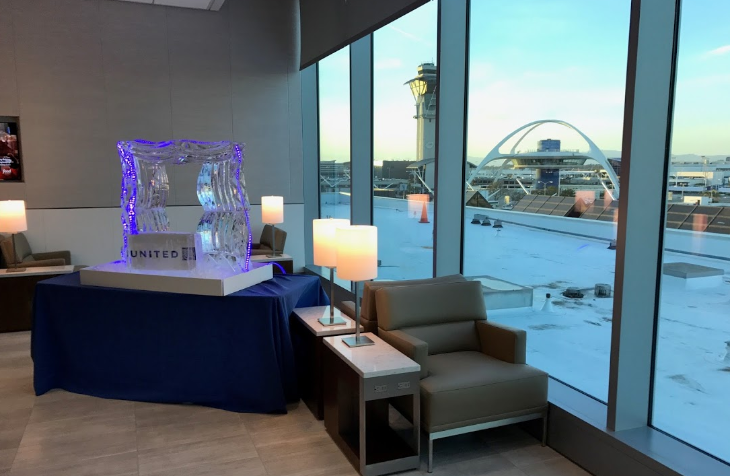 The new club is just one part of a much larger rehabilitation of United’s Terminal 7/Concourse 8 at LAX, along with a new lobby and new baggage claim areas. The airline is also working with the Transportation Security Administration to install five new automated security screening lanes, like those United recently opened at Chicago O’Hare and Newark Liberty International. Scroll down for our slideshow- all photos courtesy of Matthew Klint, editor of the LiveandLetsFly blog. Check out that iconic LAX view! Many thanks to Matthew Klint for kindly acting as our correspondent and sending us photos from the ribbon cutting event in Los Angeles! Those dreams came closer to reality when Turkish started nonstop service between San Francisco and Istanbul last year. My interest was heightened even more when it launched nonstops from Atlanta last month because many TravelSkills readers hail from there. Regrettably, unrest in Turkey has resulted in a decline in visitors to the country. 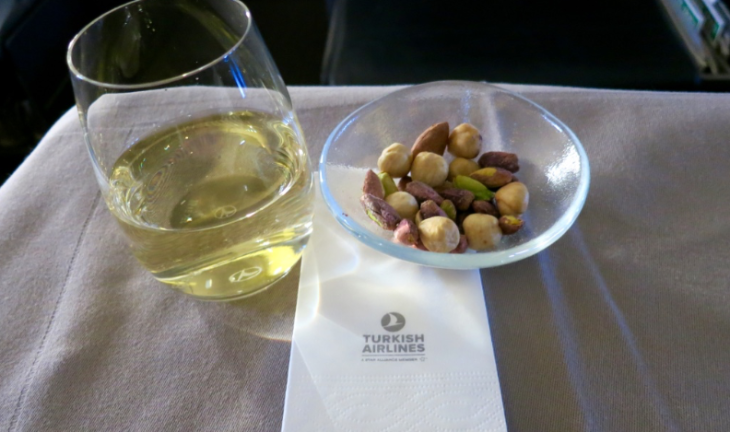 So when Turkish offered to fly me from SFO to Istanbul (IST) for a TravelSkills Trip Report, I asked if I could fly to Athens instead and report on the experience using IST as a connecting airport, which I thought would be a much more likely scenario for our readers. Currently, about 60 percent of its passengers are transiting IST instead of starting or stopping trips there, and that number could rise. Since neither SFO or ATL have nonstops to Athens, connecting to Greece via Istanbul (IST) is an easy and convenient option for those headed there or to the popular Greek Isles. 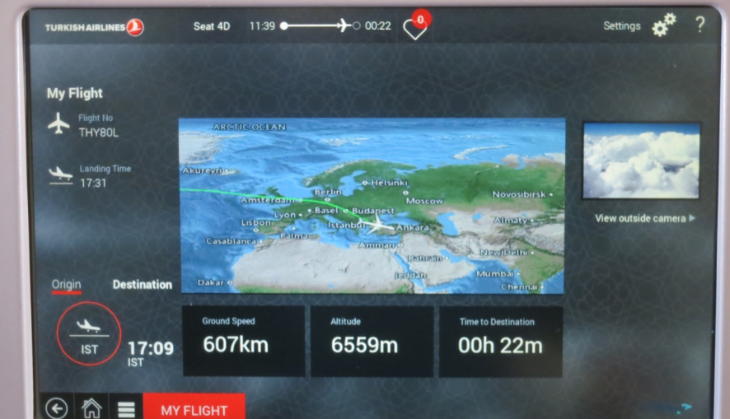 (Plus, Turkish and other carriers have deeply discounted business class roundtrips a few times this year to as little as $1,500 round trip, so set up your fare alerts and grab one if you can!) 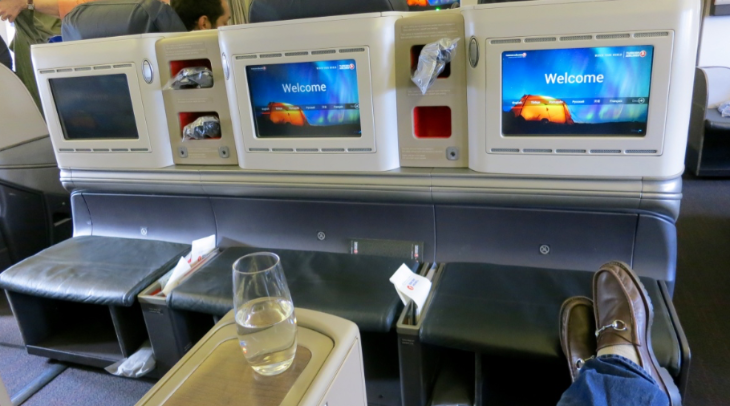 For September trips, business class fares run about $4,000 round trip. Economy is about $1,100. There is no first class or premium economy “comfort” class on the SFO flights. 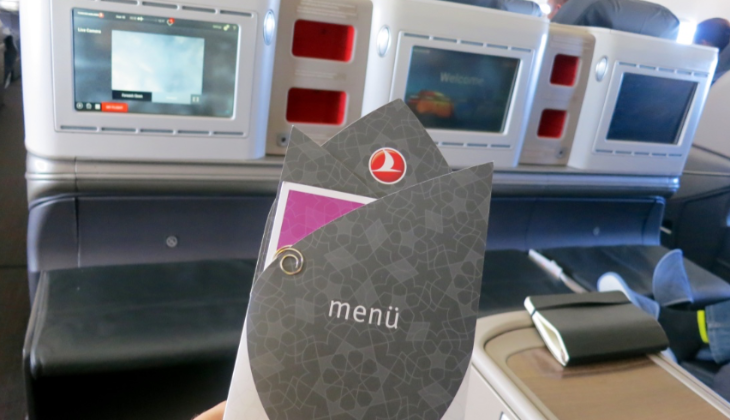 Turkish is a member of the Star Alliance, so United Mileage Plus members can redeem miles for Turkish Airlines trips. My trip to Greece and back was quick…just four days on the ground there, plus two days flying. The flight from SFO to IST runs about 13 hours. From Istanbul to Athens is a short hop– only about 90 minutes. So the entire journey, including a quick 90-minute layover in IST was about 15 hours. Check in at SFO was smooth and easy at about 4:30 pm. There were only three people in the business class line and a very friendly, talkative agent wearing a hijab checked me in and told me to proceed to the United Club on International Concourse G.
Flight 81 departs SFO at 6:10 pm, so the club was very busy since several flights depart at around this time. 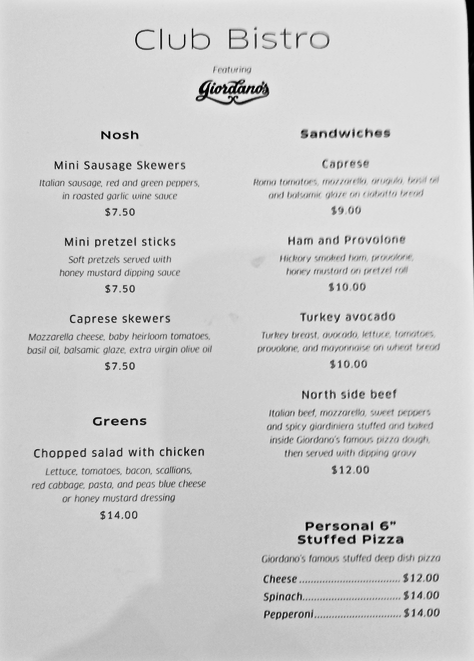 Good news: United has upgraded the food station in the club, offering a broad selection of cheeses, sausages, vegetables, hot soup, bread, crackers and cookies. Plus the spread now has a nice view! Other than that, the United Club has not changed much since my last visit. When I’m flying to write up a TravelSkills Trip Report, I usually ask if I can board a few minutes early to get some good photos of the cabin before passengers board. 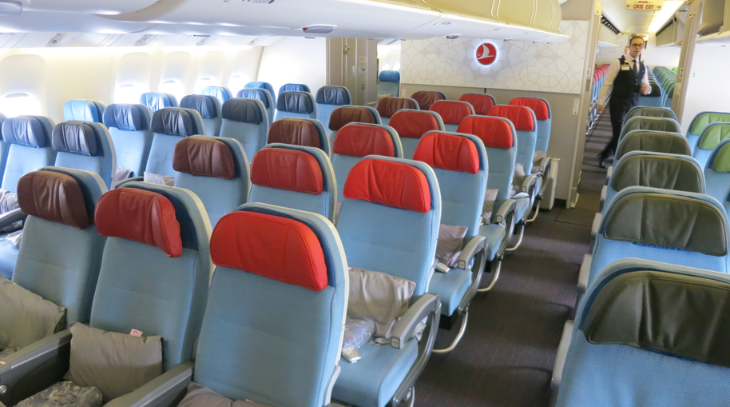 Thankfully, Turkish obliged and I snagged some great shots of both business and economy class cabins. I was unable to get an good image of the plane (a Boeing 777-300ER) from the gate area, so I’ve used one from the inaugural arrival at SFO in April 2015.
Business class seats are configured 2-3-2. Since you get outstanding views of North America and nearly the entire continent of Europe during this flight, a window seat is my recommendation. Plus it’s quieter and less likely to be disturbed by movement in the aisle if you are sleeping– and that’s the main upside to the dreaded “middle seat” seen below. Those are the “E” seats. Business class is split into two sections on this plane. What you see above is the forward cabin, which has four rows. The aft cabin, behind the galley, has three rows. What I really liked about this cabin is its open floorplan. 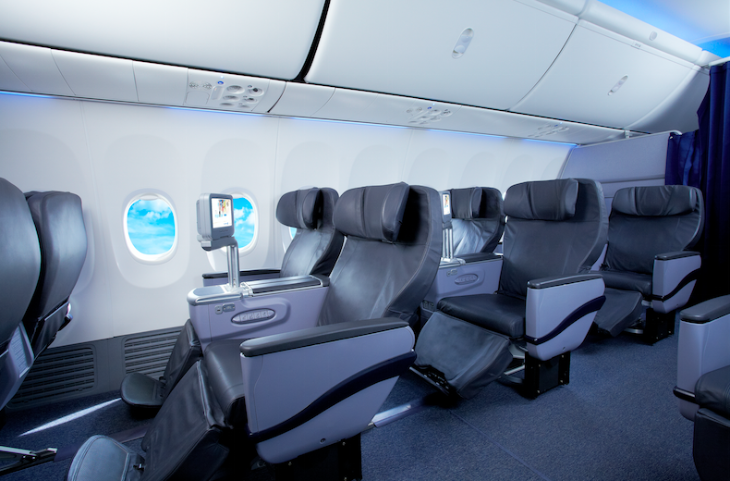 Low seatbacks make it very social and fun compared to other layouts which cocoon passengers in their own little worlds. 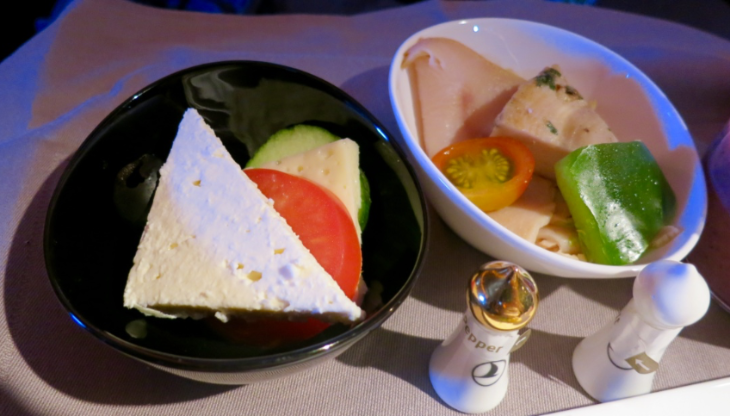 Plus, in this cabin style, I could watch flight crews as they went about rolling out the elaborate inflight meal service. If you are like me, and like to watch what is going on, book a seat near the rear of the cabin. If you want to sleep or work, go for one near the front. There are miles of legroom between the seat and seatback. It’s tough to use those nice leather ottomans as footrests due to the distance, but it’s a perfect place to sit and visit with friends or colleagues face to face. Note the storage space for shoes and other items underneath the ottoman. When the seat is in full recline, the ottoman becomes part of the lengthy bed. 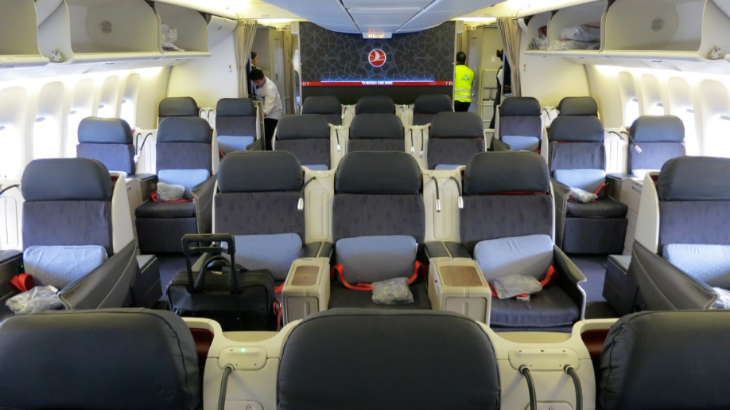 Unlike other Turkish Airlines B777 flights, the planes on the SFO run do not have a premium economy or “comfort” section. Economy class on the Turkish 777 is 3-3-3. 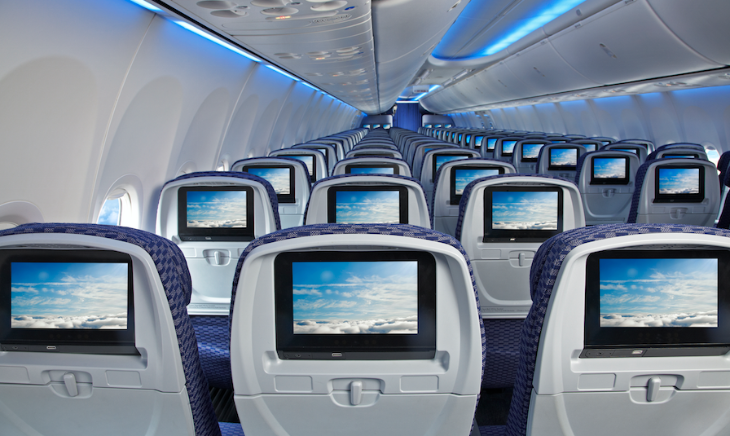 Each seat has a large IFE screen plus USB power. Okay, let’s get back up front and take a look at the service and the seat in business class. First thing you should do before boarding a Turkish flight is learn how to say THANK YOU in Turkish. 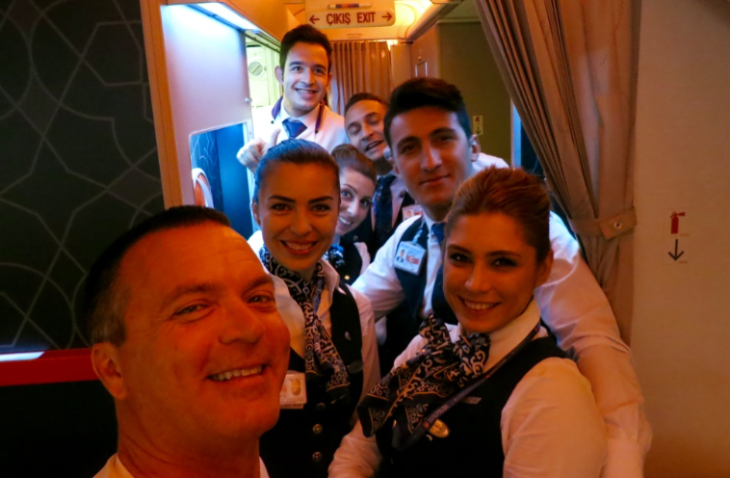 You would not believe the big, surprised smiles you get from the crew when you say Tesekkurler when they help stow your bag, offer you a juice or help make your seat into a bed. It’s pronounced something like Teh-shay-koo-lahrd. Here’s how to say it! Just do it! 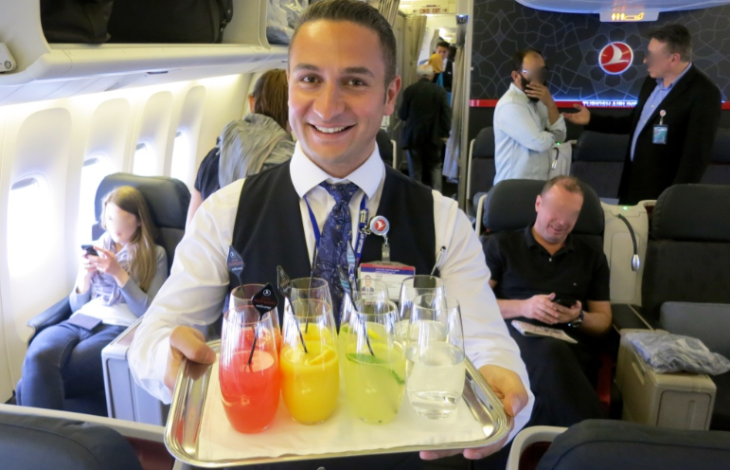 I’ve heard over the years that getting a cocktail on Turkish Airlines is complicated. That’s mostly due to the country’s (and current government’s) Muslim roots. For example, Turkish recently stopped offering alcohol on its domestic flights and on several international flights to other Muslim countries. 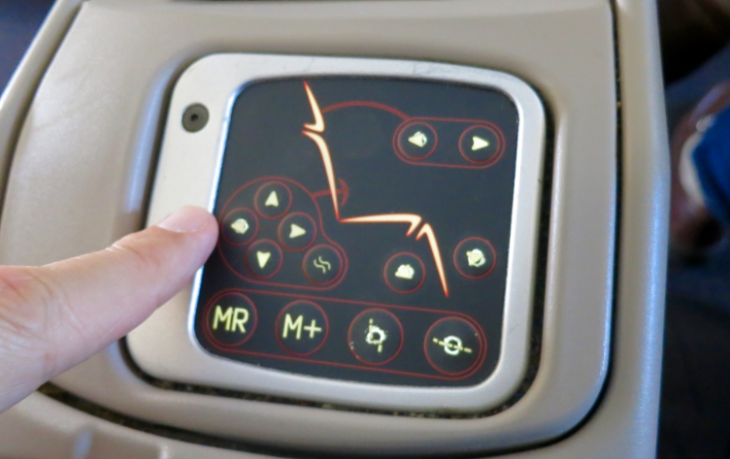 Seats are comfortable, but I never really understood this recliner control. I still don’t know what the MR and M+ buttons do! 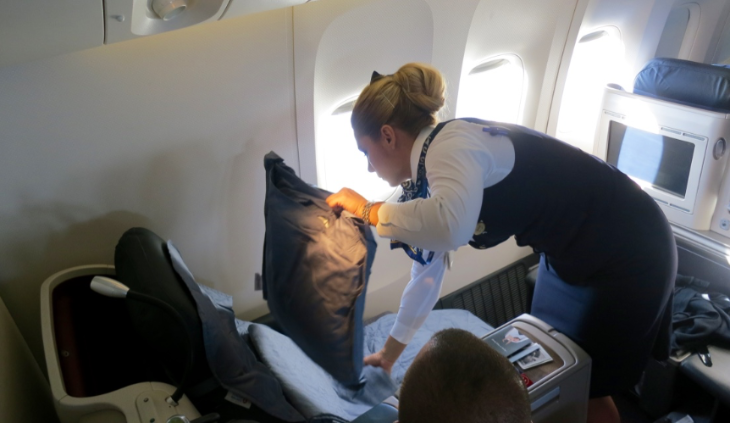 Similar to what I experienced on Qantas (See our Qantas Trip Report), a flight attendant will make your seat into a bed at your request, covering the seat with a fitted quilt, offering a large pillow and a blanket. 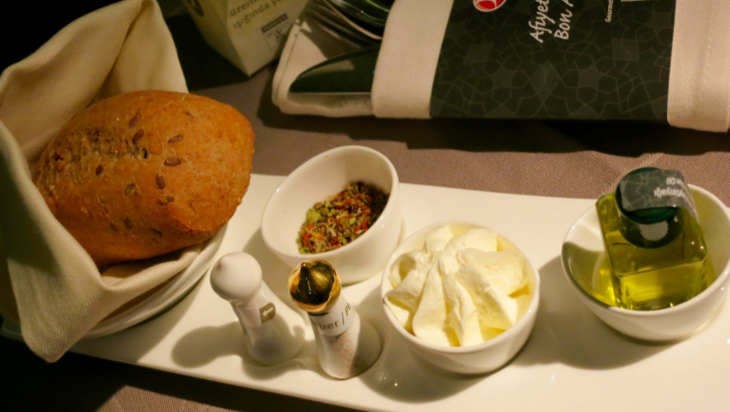 Turkish does not offer business class passengers pajamas for this 13-hour flight. 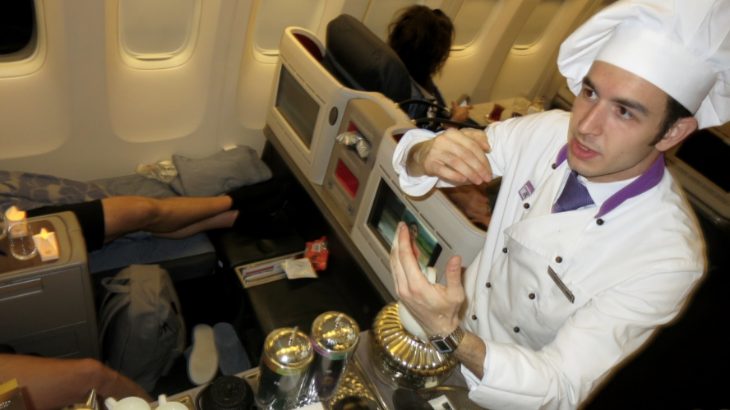 One this B777 flight, there were 15 crew members, including three chefs and four flight attendants in business class. 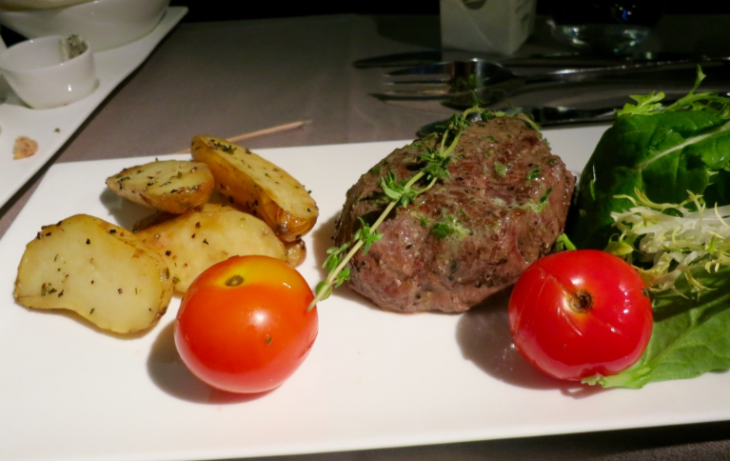 On SAS, “Chefs” are really flight attendants who change clothes to serve meal. 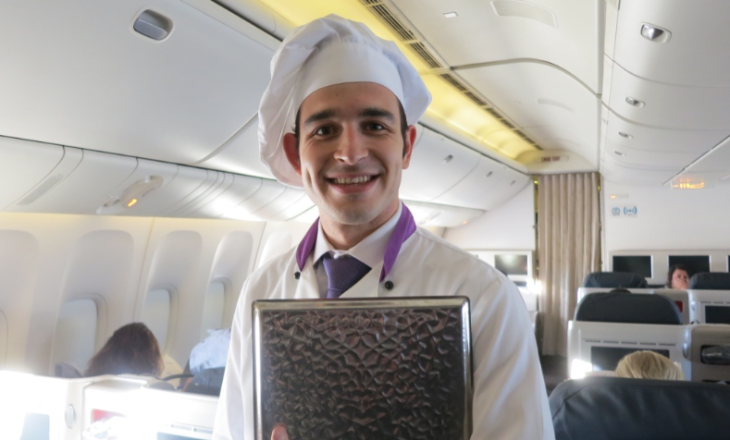 (See our SAS Trip Report) But on Turkish, these guys are dedicated to meal service throughout the flight– there were three onboard in both directions. And that’s just the starters! After that, the main courses come. Thankfully, the beautifully orchestrated service takes a while, so it gives you time to assimilate all the food. And I can’t think of a better way to pass the time on a 13-hour flight that departs at dinner time. But I know that a lot of folks would rather just eat quickly and go to sleep and if that’s the case, you can order a open-faced salmon sandwich and cheese cake at any time. My experience on Turkish was replete with those “small things” that really make a big difference. For example, bread is served in a special cloth pouch to keep it warm and moist– have you ever noticed how fast bread dries out while flying? Not here. 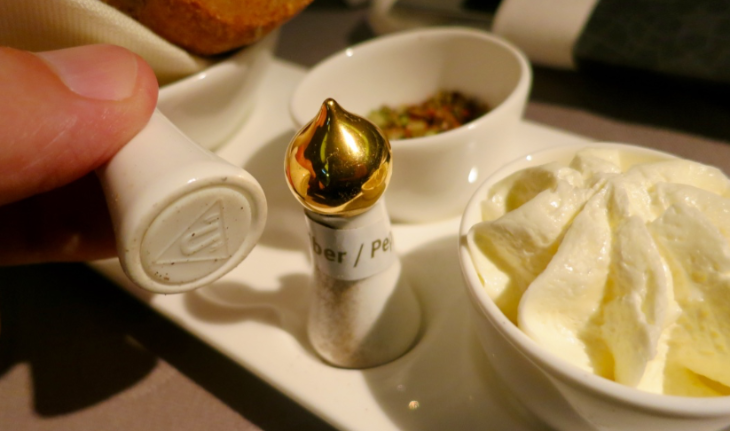 Also note that you get both butter and olive oil for your bread, and a small dish of Turkish spices in addition to real salt and pepper shakers. And get this…. they are magnetized so they stick to the plate! By far the most noticeable small touch are the votive candles in tiny bags placed on each dining tray. While these are small electronic votives, they flicker just like the real thing, and add a warm and welcome ambience to the meal service. It’s quite a nice sight to see the entire cabin filled with these flickering lights. Good job! 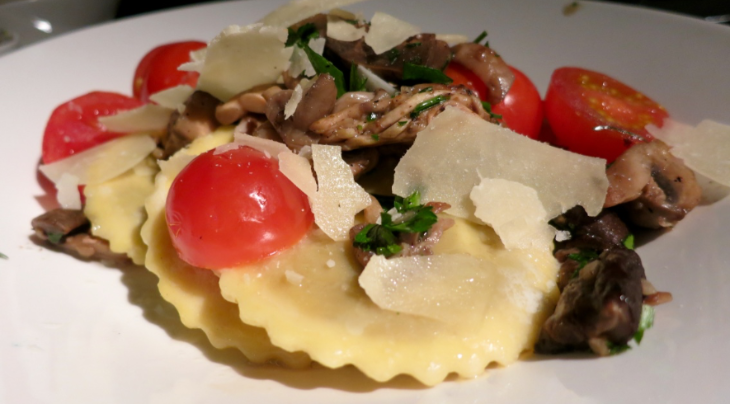 Main dishes included grilled salmon with parsley butter and zucchini, filet of beef with arugula and roasted potatoes, or mushroom ravioli with leeks, tomatoes and parmesan. After the main course, there is even more! A dessert and cheese cart including several baklava-type Turkish desserts plus apple pie, chocolate mousse and strawberry ice cream. Phew! I agree with the advice I’ve received from others: Do not eat at all before getting on the plane. You’ll regret it! Turks are really big on tea, and the tea selection was endless, including an anti-jet lag blend of melissa, camomille, sour cherry and lavender. For digestion, there’s a fennel, anise and caraway blend. And to help “resolve the edema, reduce the swelling,” there’s a blend of green tea, cherry stalk, cornsilk and close. For stomach relief, you get a cold blend of mint, fennel, lemon and date syrup. Seriously! After a cuppa tea, it was time to start thinking about cooling off and bedding down for the rest of the flight. But the cooling down part was tough. 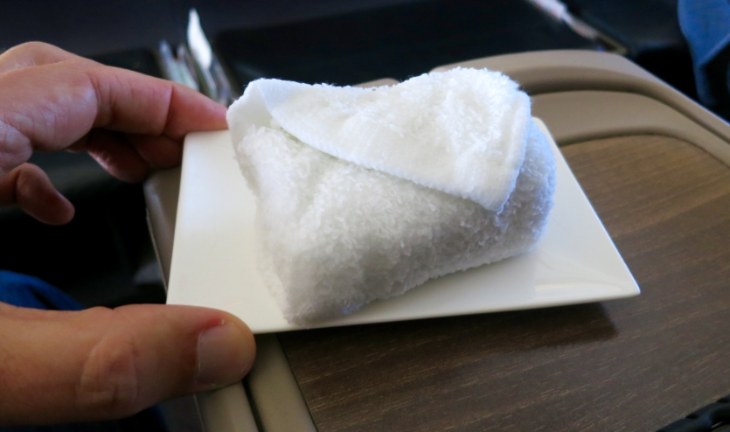 Turkish, like most other European carriers, tends to keep cabins way too warm… to the point of feeling stuffy. Maybe it’s just an American thing, but to me, a cool cabin promotes sleep and is just more comfortable. 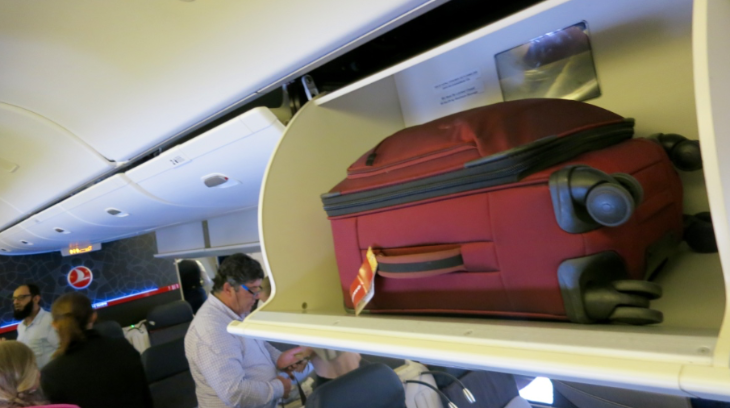 I inquired about turning the temperature down a bit, but flight attendants pushed back, stating that they are instructed to keep the cabin at 23C – about 75F, and showed me the thermostat. But the cabin sure felt warmer than that, and as you can see below, fellow passengers slept in mostly uncovered. This is not the first time I’ve suffered through an overheated flight, and probably won’t be the last, but is it just me? Or do you feel like some airlines keep the heat up too high? Please leave your comments below. 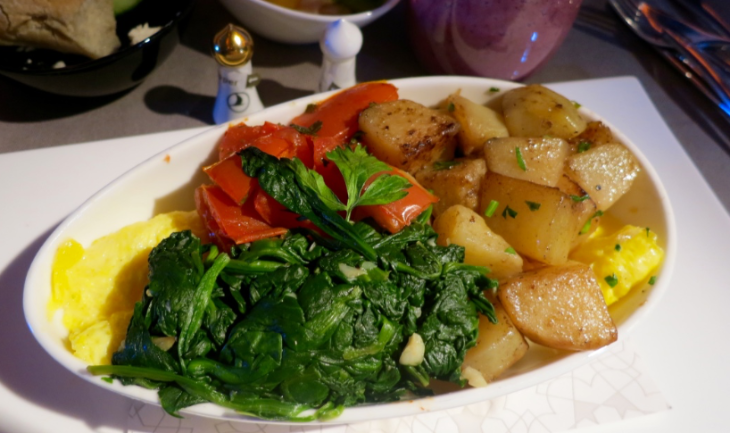 Despite the warmth, I was able to get about six hours of sleep on this flight and woke up in late afternoon, Istanbul time, for a hearty breakfast that included a small greek-like salad, cold cuts, and eggs with potatoes and spinach, coffee. Then I took a walk through the plane cabin, and had some fun with the crew just before our 5 p.m. arrival. Inflight wi-fi was free for business class passengers... but the connection was relatively weak, allowing for texting, email and light surfing, but I was unable to upload photos, or access photo-dense websites. Istanbul Ataturk Airport has clearly outgrown its space. How do I know? 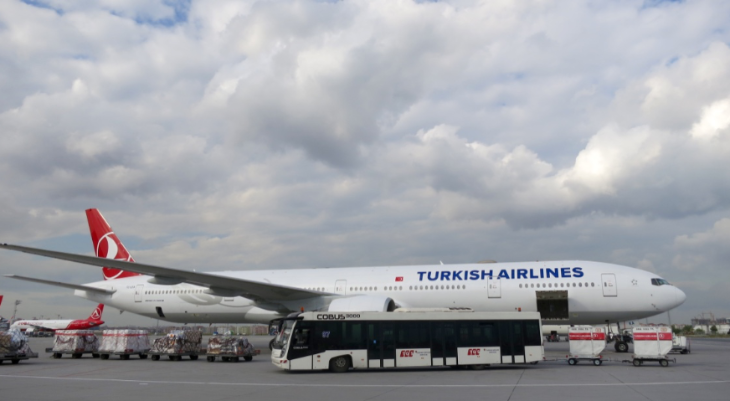 Every Turkish Air flight I was on parked at a remote pad, and passengers were bussed to and from the terminal. After a 13-hour flight, a 15-minute bus ride to the terminal is unwelcome, but did not take too long. Due to the growth, Istanbul is now laying plans for one of the largest airports in the world, to be called Istanbul New Airport, the first phase of which is to open in 2018. 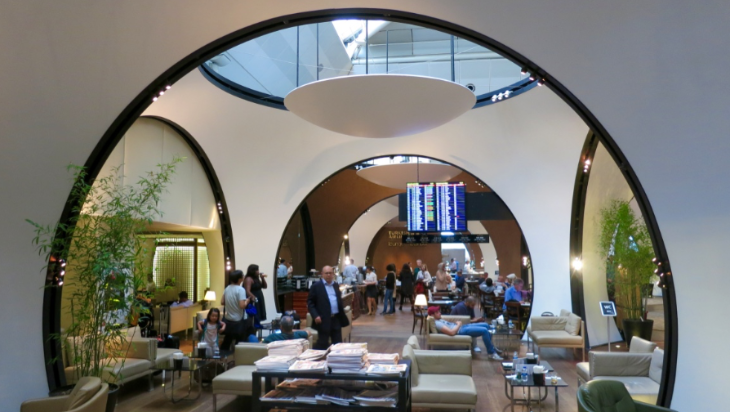 My connection from Istanbul to Athens was only about two hours, so I hightailed it to a place I’ve been waiting to see for years, the famous CIP Lounge. It turned out to be everything I’d dreamt of, and more… and my only regret is that I did not have enough time to really soak up all it had to offer! Like pool tables, olive bars, fresh pizza, a driving range, two grand pianos and more! 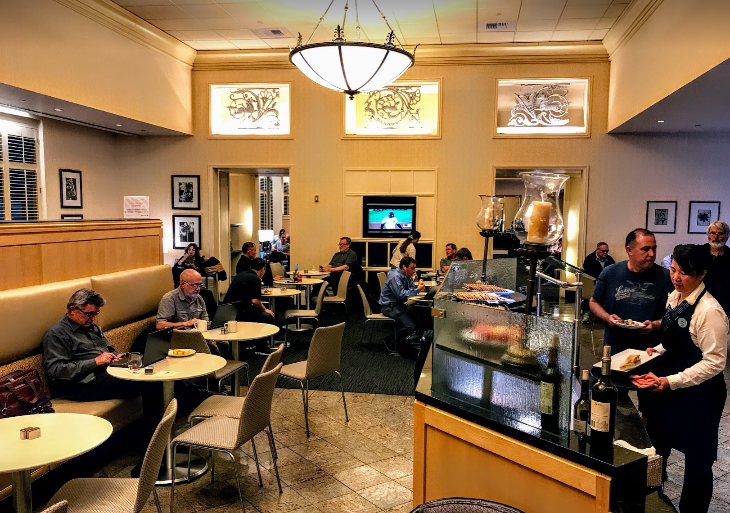 This post is already long enough, so stay tuned for Part 2, which will include a good look at the lounge and my trip from Greece back to San Francisco. Thanks for reading this far! 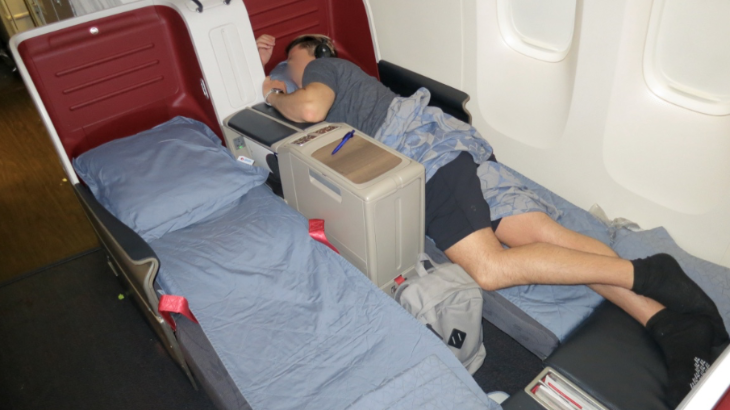 Have you flown Turkish Airlines before…or dreamt about it? Please leave your comments below. Disclosure: Turkish Airlines covered the cost of Chris’s airfare to Athens. TravelSkills paid for hotels, transfers, meals and other incidentals related to this trip. 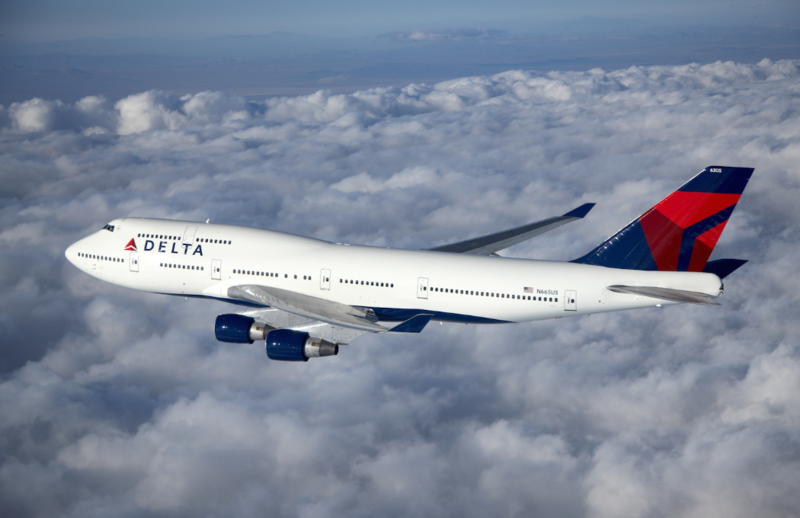 Delta’s 747-400s are so old, the carrier is moving them into museums! Check out how Delta moved this big bird off airport grounds to a final resting place near Atlanta airport where it will soon go on exhibit. In case you missed yesterday’s post: Uber is testing new fees for those who make drivers wait. Thoughts? Will undersea maglev trains someday travel NYC-London in four hours? Which Midwestern city has the highest hotel rates? Not Chicago. Get $50 in ride credits from Lyft when you use our referral link! 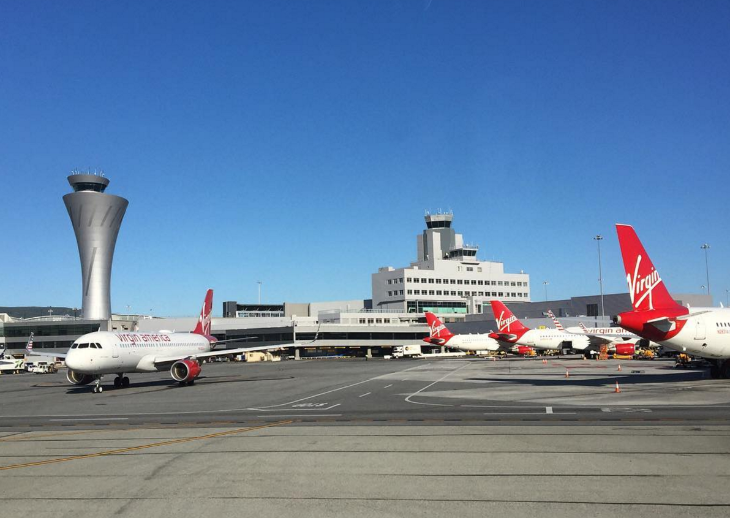 There’s a lot happening at United’s sprawling Terminal 3 at San Francisco International Airport this week. First off, the airport unveiled its big bright Terminal 3 East Concourse, which connects the recently renovated T3E space with the rest of the terminal. Until this week, passengers walked to T3E via a narrow corridor fronted by a big construction wall. The $253 million, 53,000 square foot expansion is comprised of a concourse connecting Boarding Areas E and F, a consolidated central security checkpoint, three additional gates, and a new United Club location. There are eight new retail and dining outlets, 230 power outlets, and 200 USB outlets. Big bathrooms include private changing rooms– a unique new addition to the space I’ve not seen before. There are also four new art installations, along with mod lounge-style seating areas including the now ubiquitous egg chairs (seen in silhouette above) coffee tables and big communal tables. New retailers include Aveda, Jo Malone and Tom Ford. 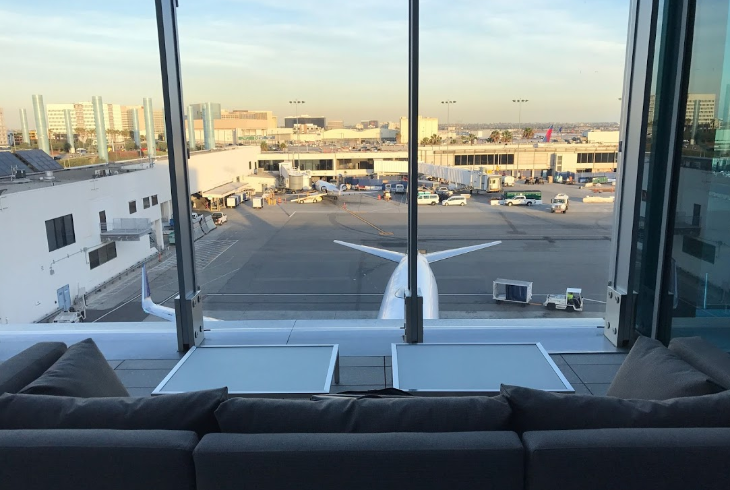 At just over 6,000 square feet, the newest United Club offers a panoramic view of airport operations through giant floor-to-ceiling windows. There’s space for 130 members in the new Club, and when it’s crowded, it will feel that way since there is not a lot of empty space between chairs. Nonetheless, the space feels light and airy due to the big view out to the ramp and a pale color palette. Plus, there are two small rooms with desks and glass doors that close if you need privacy. 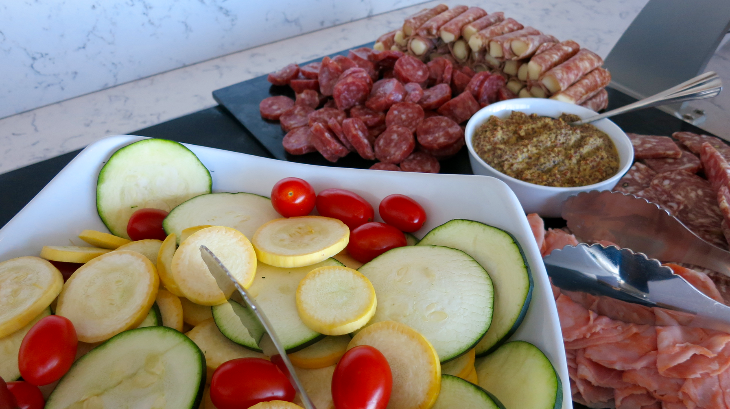 There is one main room adjacent to the bar, which backs up to the windows, and a smaller space where the buffet is set up with items such as fresh zucchini, yellow squash and cherry tomatoes; butternut squash soup; spinach salad; and a variety of fresh meats and cheeses, and the standard hummus and mediterranean salad available at other United Clubs. 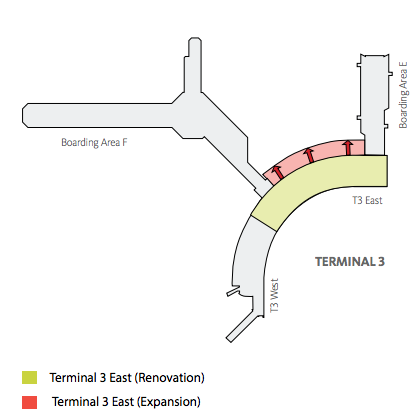 The new Terminal 3 East club will operate in addition to the larger, but relatively dated United Club location in Boarding Area F and in International Terminal G. There are some long range plans to get this old club up to new standards, but it will be part of an overall revamp of the rest of Terminal three that is still several years off. But eventually all of Terminal 3 should be as hip and bright as the new T3E boarding area. The temporary, windowless United Club on the mezzanine level that opened last year is now closed. 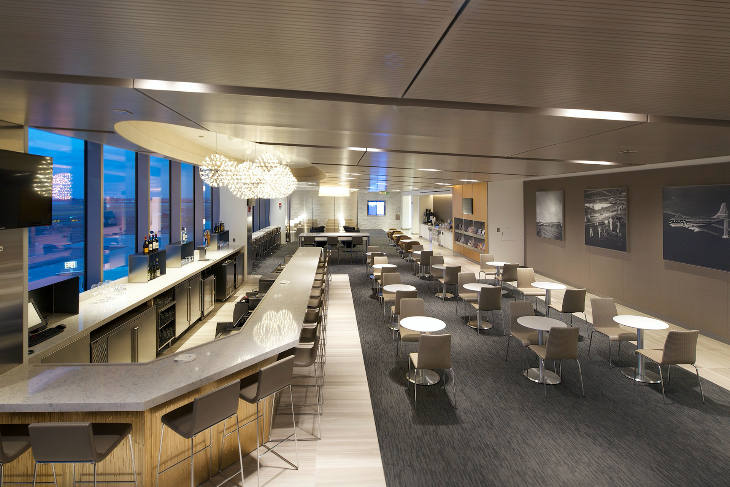 The “look” of this club is nearly identical to recently remodeled United Club locations in Atlanta, Chicago, San Diego, Seattle, Boston and London. 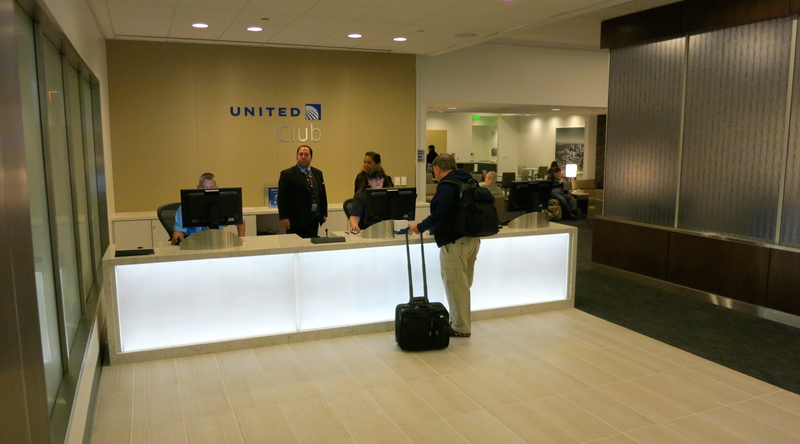 Have you been inside a new United Club recently? What did you think? Please leave your comments below. 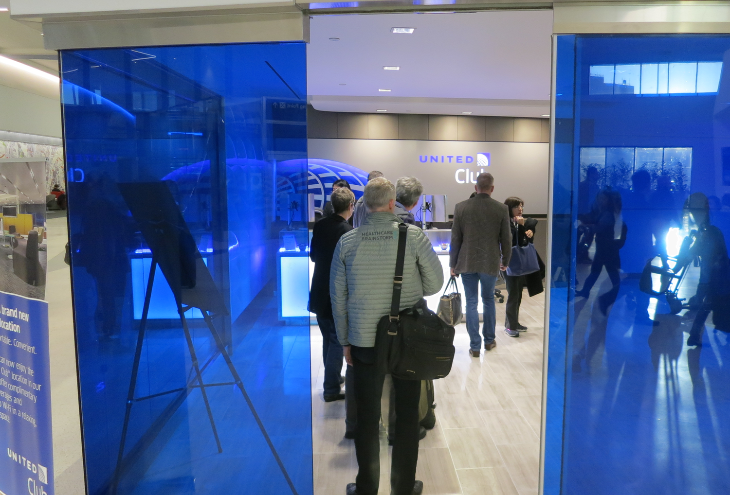 Today United opened a brand new United Club at Atlanta’s Hartsfield-Jackson International Airport. 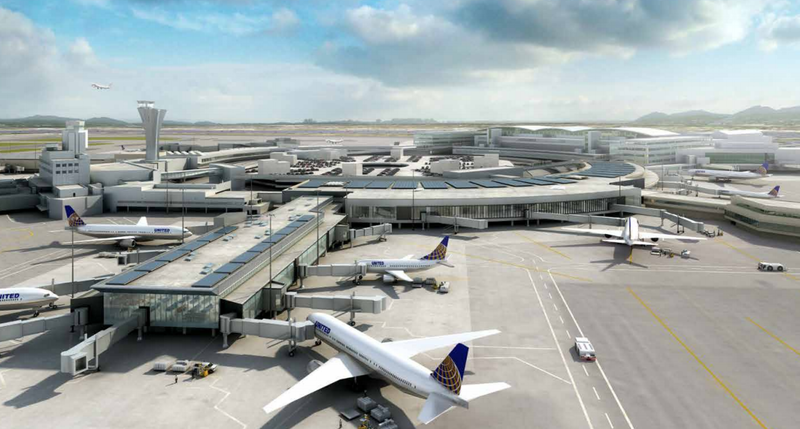 On Wednesday, the long awaited new United Club will open near the new Terminal 3 E boarding area at San Francisco International. We’ve not seen either club yet, but will take a sneak peek of the SFO Club on Monday, so stay tuned! The nearly 5,000-square-foot Atlanta United Club opens today. 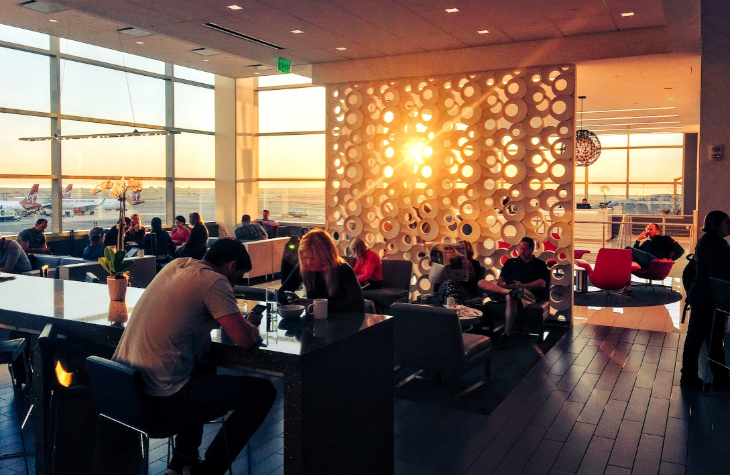 The club features stunning panoramic views of the airport as well as seating for more than 100 people, giving travelers a comfortable and convenient airport getaway where they can unwind during their journeys. The modern design also features vintage aviation artwork throughout the club, and visiting customers may dine on complimentary fresh-food choices, including yogurt and fresh fruit; muffins in rotating flavors of cinnamon and blueberry; sliced red bell peppers with hummus; rotating seasonal soups; and spicy Bloody Mary trail mix. The Atlanta club is located between gates 11 and 12 at Hartsfield-Jackson International Airport’s Concourse T, on the mezzanine level. 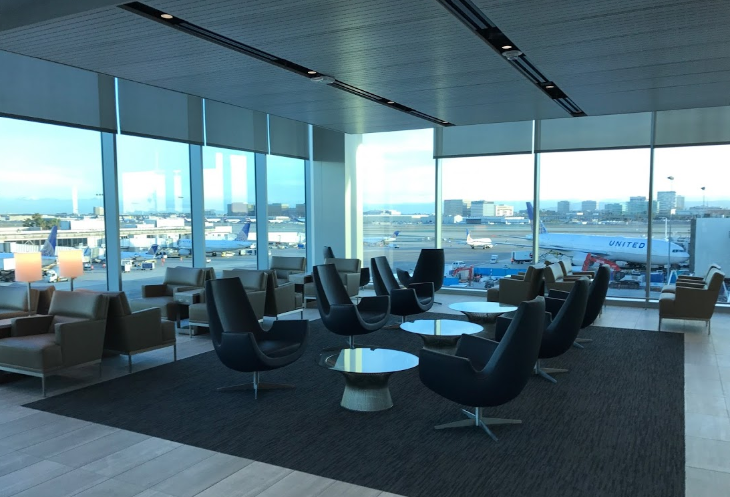 At just over 6,000 square feet, the newest United Club at San Francisco International Airport will first welcome travelers on Wednesday Nov. 18. The club will offer a bird’s-eye view of airport operations and a gallery of photos of United’s history. 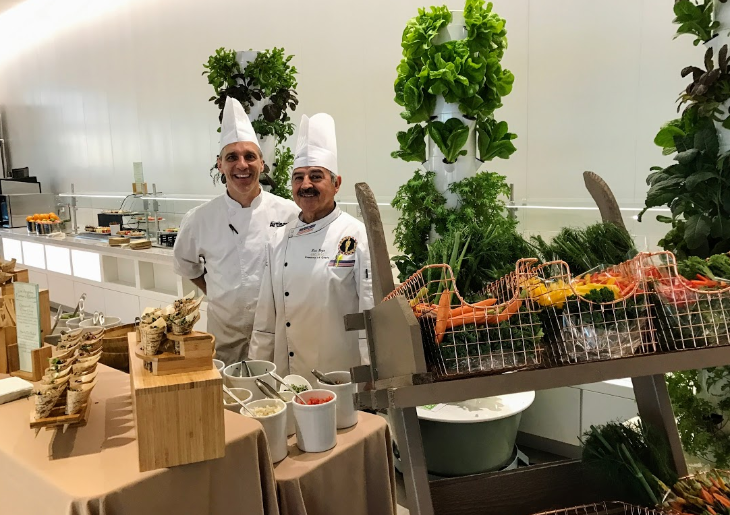 Comfortable seating can accommodate more than 130 people who will be able to enjoy a complimentary menu with seasonal choices, such as fresh zucchini, yellow squash and cherry tomatoes; hearty butternut squash soup; dressed spinach salad; and a variety of fresh meats and cheeses. The club is located in the newly renovated Terminal 3 East Concourse, scheduled to open the same day, and will operate in addition to United Club locations in Terminal 3’s Concourse F and in the airport’s International Terminal G.
Like remodeled United Club locations in Atlanta, Chicago, San Diego, Seattle, Boston and London, the new San Francisco location will offer additional work stations and abundant power outlets for customers to work with greater ease and comfort. Members may also enjoy complimentary beverages and Wi-Fi, as well as premium wines and spirits. What’s your favorite airport club? Least favorite? Please leave your comments below! Take the TravelSkills Reader Survey, please! 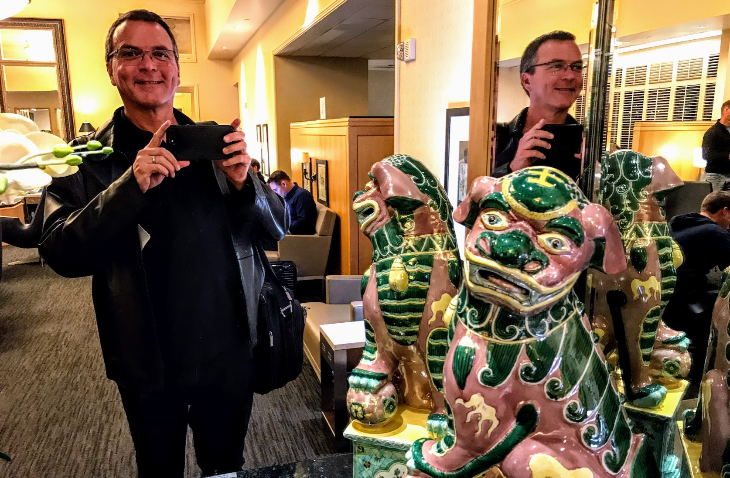 NOTE: Be sure to click here to see all recent TravelSkills posts about: Trip Report: Singapore Airlines + 5 ways to save using Uber/Lyft +Best/worst airports for Thanksgiving + Trans-Pac fare war? 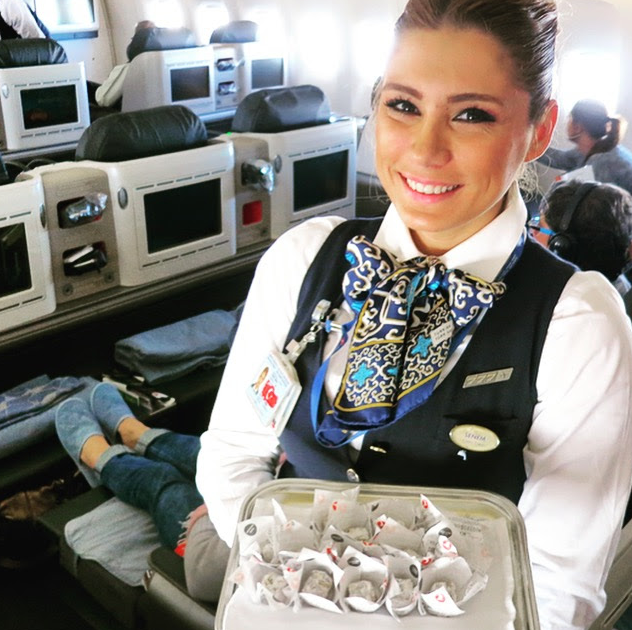 Is Copa Airlines right for you? Last week, Panama’s Copa Airlines touched down in San Francisco, the carrier’s 12th U.S. destination. 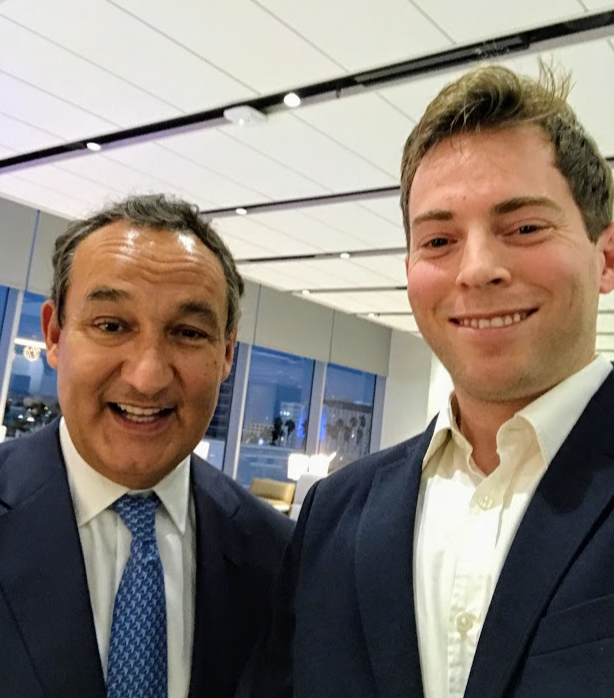 TravelSkills was at the airport to welcome the airline to town, and grabbed a quick interview with Fernando Fondevila Leyton, Copa’s commercial regional manager for North America who was as eager to answer our questions as we were to ask them. Here are some interesting points we picked up in that conversation. First a little history. Does that livery look familiar? It’s because at one time, Continental owned 49% of Copa Airlines, and at that time the carrier adopted Continental’s look and its OnePass program as its own. 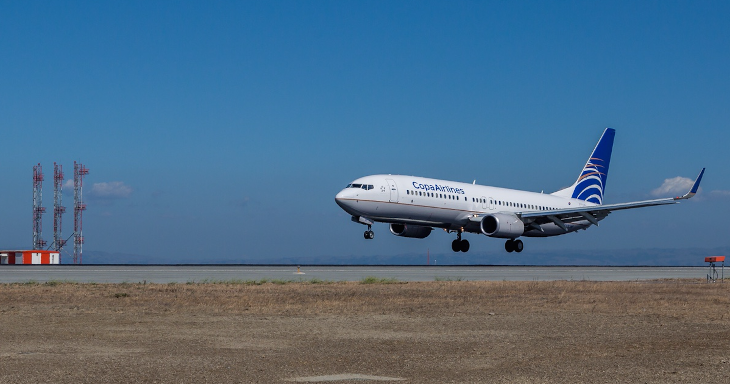 Continental eventually divested itself of its interest in Copa, but the carrier kept the look (which now looks almost like United) and has no plans to change it. Copa is a member of the Star Alliance and has full reciprocity with the United Mileage Plus program. Also, United Club members get access to all five Copa Clubs. 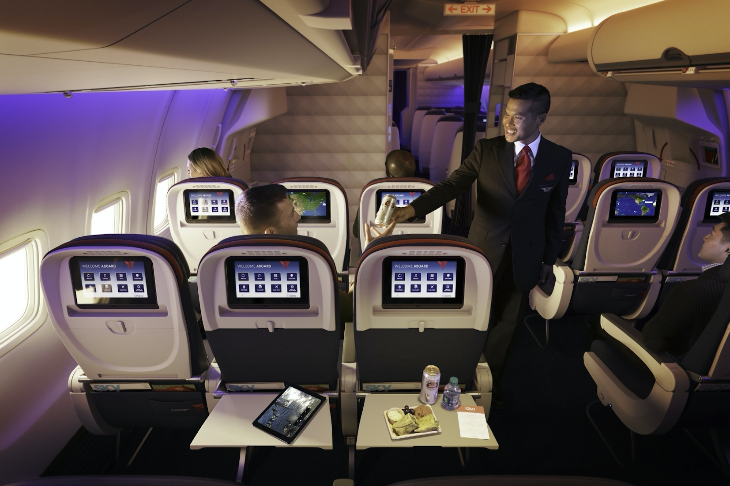 Until earlier this year, Copa used United’s MileagePlus program as its own, but launched its own program, ConnectMiles last summer. The big deal here is that ConnectMiles will match the your elite status with other airlines– all you have to do is join ConnectMiles and then send them a screenshot of your current elite statement and a copy of your card, and you are in. And get this, once you get your status matched, Fondevila explained that it’s good all the way through February, 2017. 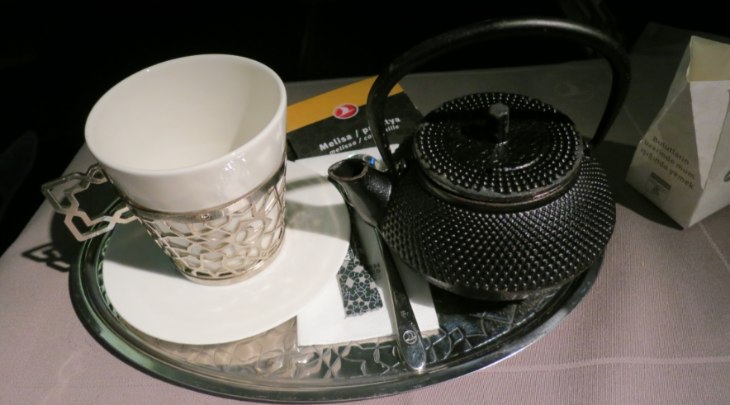 What’s best for members of United’s MileagePlus program is that gold status on a foreign Star Alliance partner carrier means you get access to United Clubs when flying domestically– something you don’t get as a U.S. member. To get the status match, you must first join Connect Miles, then email the screenshots of your other-airline elite card or statement to accounts@connectmiles.com. If you don’t get an answer, call them at 1-844-287-0304 to inquire about your status. Now, let’s talk about Copa’s planes. 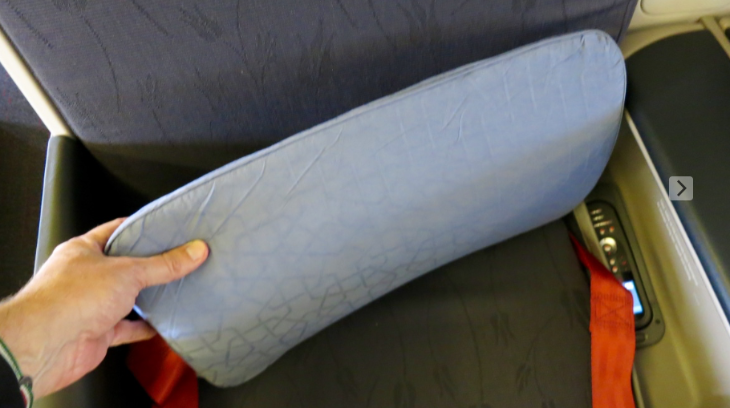 The first thing you need to know is that Copa does not offer lie flat business class seats on its flights. Instead, you get big roomy recliners with leg rests. That’s fine for the relatively short duration of most flights from the US to Central America. 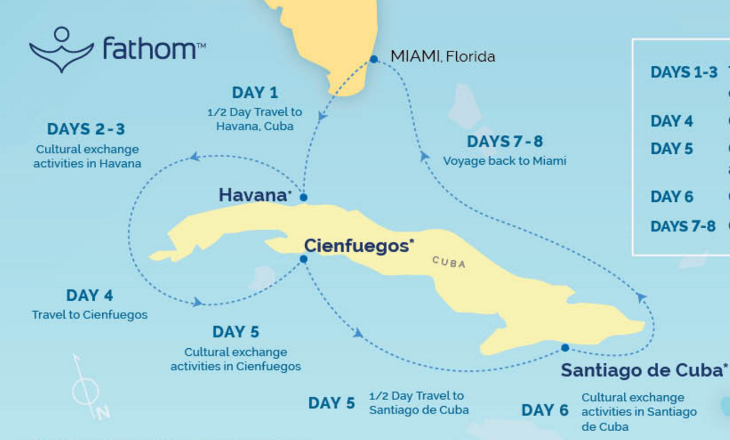 But it’s tougher on the 6-7 hour overnight flights from SFO or LAX to Panama City (PTY). The same goes for connecting flights deep into South America to cities such as Buenos Aires, Montevideo or Rio de Janeiro, many of which are overnight flights where competitors like United, American, Delta and LAN offer lie flat seats. 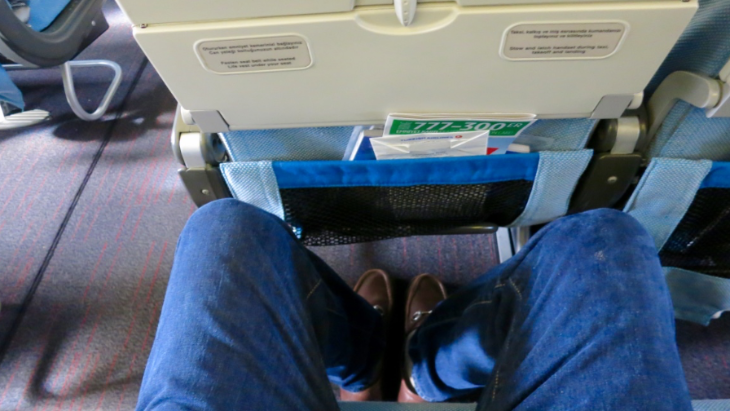 Plus, there is no premium economy class product and seat pitch is the standard 31 inches. However, there’s some good news for those flying in economy class– Copa does not charge economy class passenger for the first two checked bags. 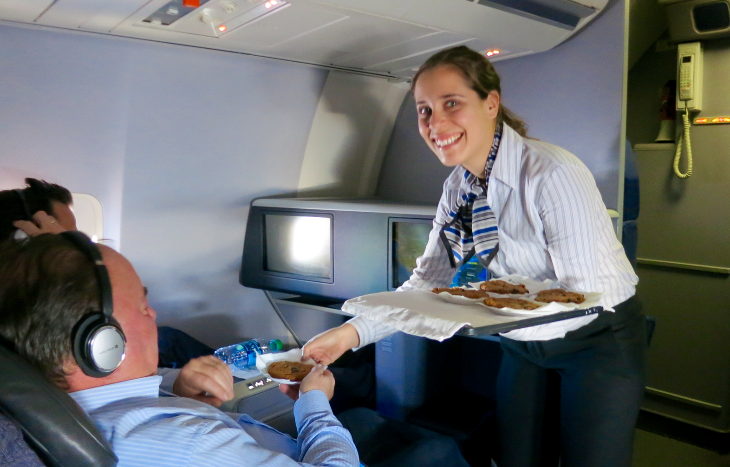 It also offers complimentary hot meals, full bar and individual in-seat in-flight entertainment on all flights. 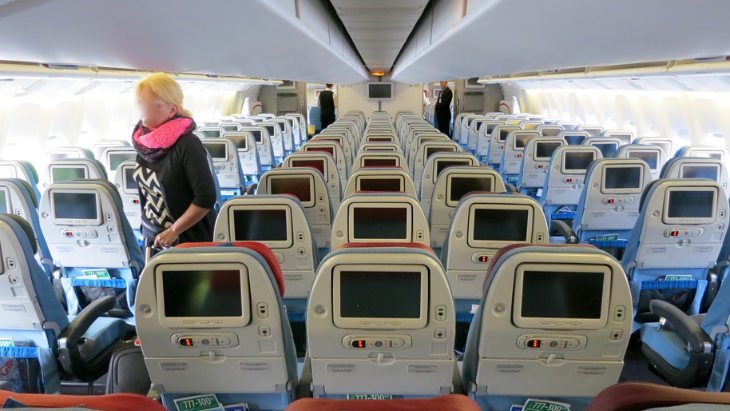 Here’s what SeatGuru says about Copa’s 737-800. Copa has one Latin America’s youngest fleets– most of its 737-800s are less than four years old and have the popular “Sky” interiors with oversized luggage bins and mood lighting. There are 16 business class seats and 138 economy seats on each plane. Fondevila says that Copa has one of the best on-time performance records in the industry, most recently at about 91% ontime. >Copa is short for Compania Panamena de Aviacion. >Copa is a Star Alliance partner, but it does not yet have a code share agreement with United on the SFO-Panama City (PTY) route. Fondevila said that they two airlines are working on that, though. >Copa flies to 55 cities in Latin America, including eight in Brazil and nine in Colombia using Boeing 737 and Embraer 190 aircraft. >Copa’s Panama City hub at Tocumen International Airport, which it calls the “Hub of the Americas,” is a key connection point– Fondevila said that 60%-70% of its traffic is connecting, and only 30%-40% is local traffic. 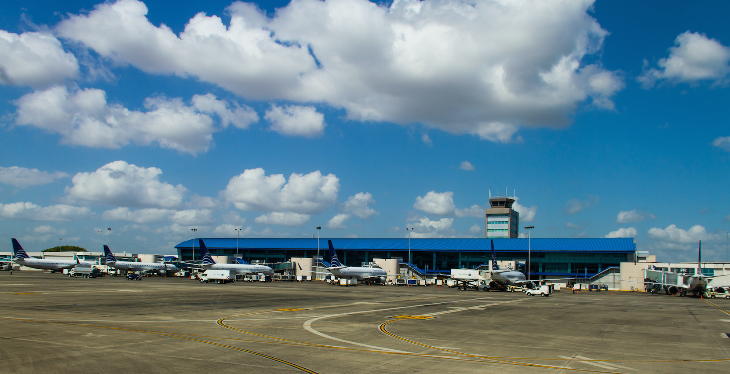 Transit passengers do not pass through immigration and customs at PTY, which makes connecting at the small airport fast and easy. >PTY has a new airport terminal under construction which should open in 2018. >The 10,000 square foot Copa Club at PTY (and elsewhere in the region) is open to United Club members as well as nonmembers with Premier Gold status. >Copa’s San Francisco-Panama City flight is a red-eye, departing SFO at 11:19 pm and arriving in Panama City (PTY) the next day at 8:32 am- good timing for business trips. The early arrival also connects to a big bank of Copa flights headed elsewhere in the region. Returning from Panama City the flight departs in the morning at 9:41 am arriving SFO at 2:54 pm. >Right now, fares are great, considering the distance of this flight. You can fly round trip SFO-PTY for as low as $400 in economy class or about $1,200 in business class, depending on the season. >Copa has been flying LAX-PTY since 2000 and now offers 3-4 daily roundtrips. 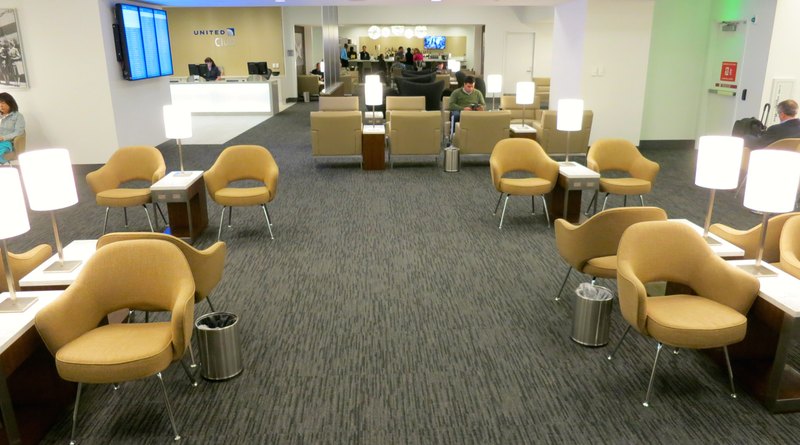 United recently completed renovations of its United Clubs at Washington (Reagan National) and Hong Kong. It says that it will complete similar renovations or add new clubs at Tokyo (Narita), Atlanta (T-gates) and San Francisco later this year. The carrier says its new Club at Washington National stands out for its new furnishings with the art deco design. In Hong Kong, loads of natural light bathe the loft-style room design. “We are making investments of more than $100 million in our clubs around our network and have made great progress this year in opening two brand new clubs at Reagan National and Hong Kong,” said Premium Services Managing Director Mike Landers. United says that the new clubs reflect the look and upgraded amenities found at its most recently renovated ones at Chicago O’Hare, London Heathrow, San Diego, Boston and Seattle. 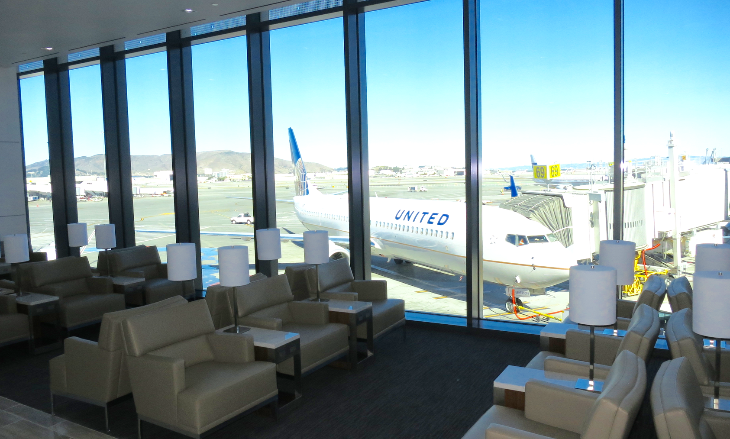 At SFO’s Terminal 3, United currently operates two United Clubs– a nice, new but temporary and windowless one on the mezzanine level of main part of the terminal, and an older facility out by the gates. The brand new state-of-the-art United Club will open this fall near the entry to the new T3 Boarding Area 1 gates. In Atlanta, United’s Club on Terminal D is now closed. United has said that a new club will open in the desirable T-gates area of the airport, but has not revealed a specific location. 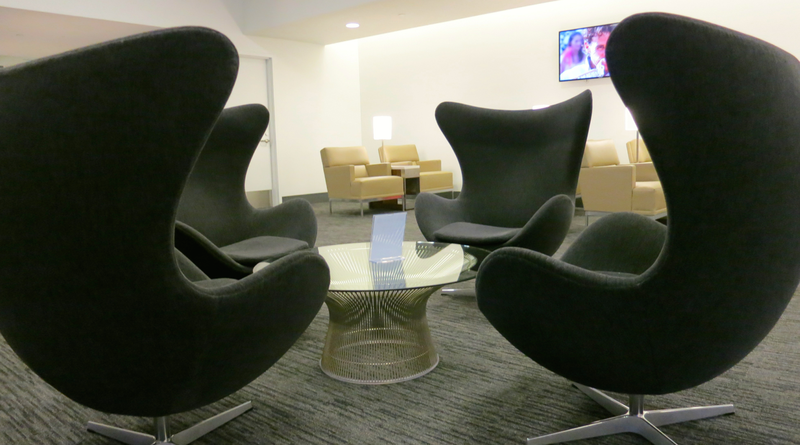 Have you visited a renovated United Club? What did you think? How do they compare to others? 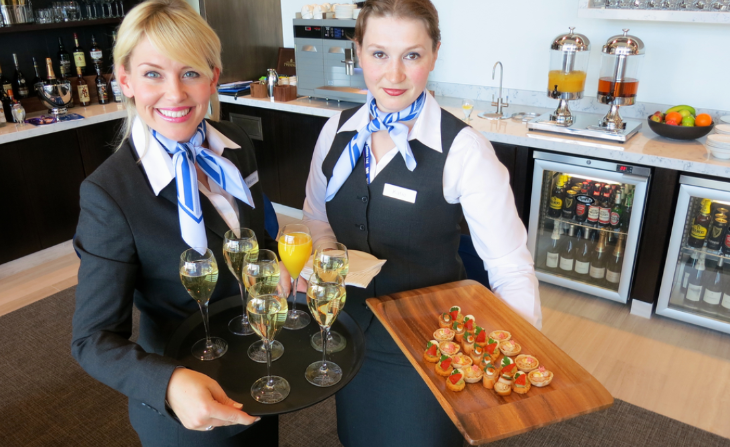 United’s newest United Club opened last Sunday and TravelSkills was there with a camera! 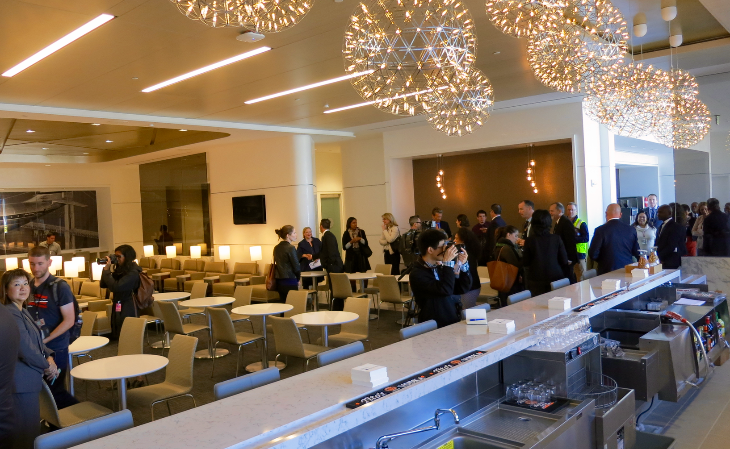 Check out the photos and deets on the new Club located at San Francisco International Airport, Terminal 3, on the mezzanine level between boarding areas E (the new one) and F.
The 5,000 square foot, 103-seat club is temporary. It will be open for just 16 months while a newer, larger (5,500 sq ft, 130 seat), brighter (tarmac facing windows), swankier club (like the new one in London) is built on the main level closer to the brand new Boarding Area E. The new club is scheduled to open in 2015. “The new United Club will have everything the London club has except [the replica of] Big Ben,” said Nina Moore, United’s Senior Manager of Airport Lounges who was at SFO from Chicago for the opening. By comparison, the current United Club on the Rotunda in boarding Area F is 18,000 square feet with 274 seats. While the new space is modern, super clean and well appointed, the lack of windows gives it a somewhat claustrophobic feel. What alleviates that are the oversize vintage black and white photos strategically placed on walls throughout the space which help open it up. 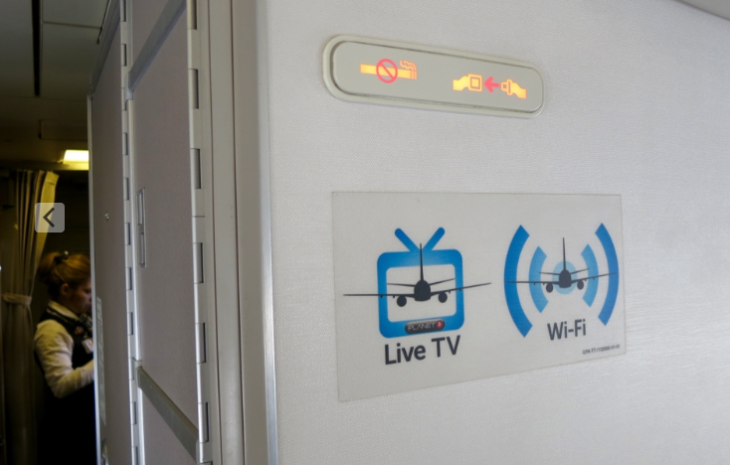 There are power outlets (standard and USB) by every seat and the free wi-fi is good and fast. Clusters of modern “egg chairs” give it a Scandinavian feel. When I was there at around 10 am on Sunday, the breakfast offerings were standard United Club: Bagels, cream cheese, donuts, yogurt, cereal, coffee, some fresh fruit. 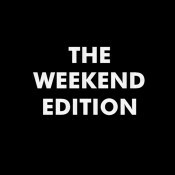 And to celebrate the opening on Sunday, free champagne or mimosas. There’s also a full bar area with cafe style tables. Bathrooms, but no showers. Who gets to go to the United Club? Members, those on one-time $50 day passes, Priority Pass cardholders (but not including “Select” members who get cards as a credit card bennie), United MileagePlus Explorer Card holders, international first and business class passengers, Star Alliance Gold members and BusinessFirst passengers flying on United’s p.s. flights to New York-JFK. Also, United Star Gold member with valid Star Gold card and same day departing boarding pass in conjunction with Star operated INTERNATIONAL flight. Star Alliance Gold members with valid Star Gold member card and same day departing boarding card from SFO for Star operated flight. Here’s a link to help understand who gets in. United is in the process of revamping and enhancing all its United Clubs. The latest to get the once over are at airports in Chicago, San Diego, Seattle, Boston and London. Are you a United Club member? What do you think of its Clubs? P.S. Facebook is taking its sweet time merging our previous pages into the new TravelSkills Facebook page. 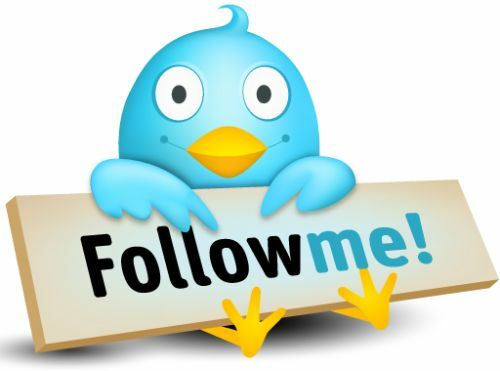 If you like to stay in touch and get breaking news/deals updates that way, please visit the page and LIKE it. Thanks! Please join the 25,000+ people who read TravelSkills every month! Sign up here for one email per day updates! Last week TravelSkills snagged an exclusive hard hat tour of the new Boarding Area E at United’s Terminal 3 at San Francisco International Airport. As you can tell from my slideshow photos, there’s still quite a lot to do before the new $138 million, 65,000 sq ft space opens in late January. 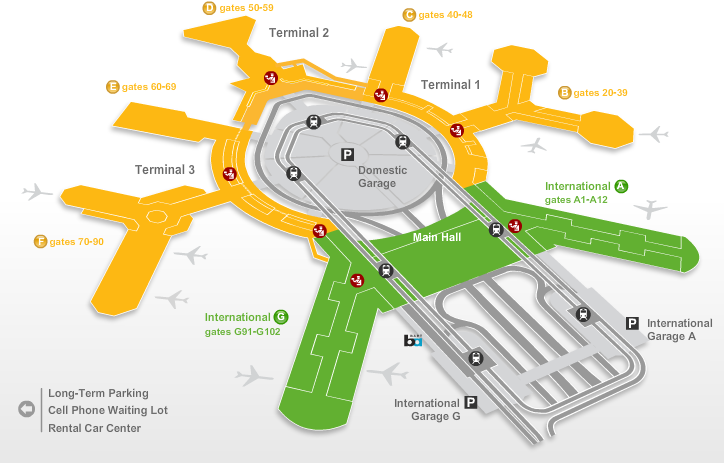 >First, for a little background: United’s Terminal 3 consists of boarding areas E and F. Boarding Area F is currently in use. 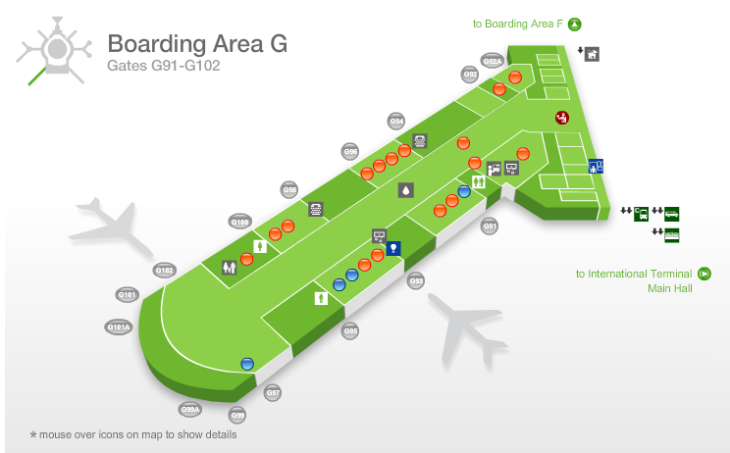 Boarding Area E housed American Airline’s operations until it moved into Terminal 2 in 2011. After closing, Boarding Area E was stripped to the studs and then rebuilt slightly larger (one gate added, for a total of 10). >The new Boarding Area E will open on Tuesday, January 28th say airport officials and the design-build team of Hensel Phelps and Gensler. >If you are a fan of SFO’s popular new Terminal 2 (housing Virgin America and American), you’ll likely enjoy the new Boarding Area E.
>Like T2, the space will be bathed in natural light, plenty of art, local concessions and modern, functional furnishings. Unlike T2, the color palette will be warm, with plenty of earth tones like tan, gold, brown, yellow and olive green. Other familiar sights will be water bottle filling stations and a yoga room. 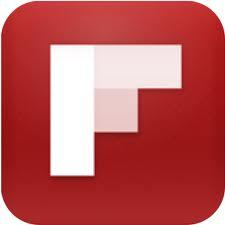 Subscribe to TravelSkills- via e-mail! >Bathrooms are large, and like much of the terminal, sheathed in local Heath subway tiles, which are handmade in Marin County. Bathrooms have windows out to the ramp, and also include dressing rooms where passengers can change clothes. >Three of SFO’s most valuable works of art (by Wayne Thiebaud, Robert Bechtle and Robert Torlakson) will be displayed prominently along the main corridor of the boarding area. >Similar to T2, the new space will be saturated in public wi-fi nodes ensuring fast, free connections, plus there will be plenty of tabletop workspace and electrical outlets galore. >Unlike the windows in Terminal 2 which are covered in tiny spots (called “frit”) to block heat and glare from the sun, most windows in this space only have it near the top… which makes for much better runway views. Airplane and airport nerds will geek out over the huge 25-foot-wide picture window at the north end of the concourse, which will offer some of the best views of taxiing aircraft anywhere at the SFO. >Some familiar brands will be back as concessions: Mission Bar & Grill, Klein’s Deli, Dogpatch Café. There’s a special space set aside for small businesses (without the means to sign long term leases) to show their wares. For the first year, these “pop up” spaces will be occupied by a Berkeley art dealer and a purveyor of wine country olive oil. >When Boarding Area E opens on January 28th, departing passengers will continue to use the current ticketing counters and security entry points. From there, they’ll have to take quite a long walk (500-900 feet depending on which checkpoint you use) to the entry of Boarding Area E. Eventually (no exact dates yet), passengers will be able to enter Terminal 3 from a new eight-lane security checkpoint near boarding Area E.
>United’s flights that currently operate out of Terminal 1 will move to Terminal 3 between February and May. (Currently, passengers checking in at Terminal 3, but with flights departing United Terminal 1, must take shuttle buses under the airport to get to their flights.) Boarding area E will be used for United’s mainline flights—United Express flights will use Boarding Area F.
>Around October 2014, United’s Premier security checkpoint will move from the far western end of the terminal to the center of it… adjacent to the current main security checkpoint, which means shorter walks to flights departing Boarding Area E.
>New landing procedure at SFO should help w delays! Hallelujah! Are YOU signed up for TravelSkills- TravelSkills? If not, why not? Subscribe to TravelSkills via e-mail! 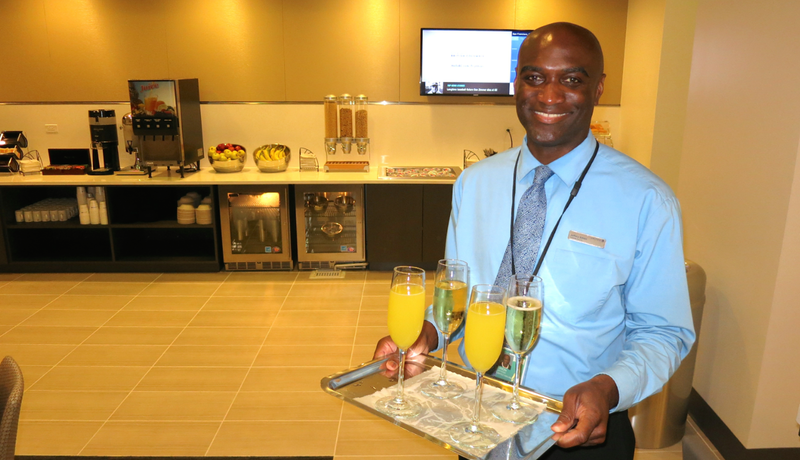 This week United and Continental celebrated the one year anniversary of their merger by christening their combined lounges with a new name: United Club. However, your Red Carpet club credentials will still get you in the door. So far, no significant changes have been announced, but United says, “In time, remodeled clubs will provide additional business-friendly features…including more workstations…” What could United do to make the clubs better? 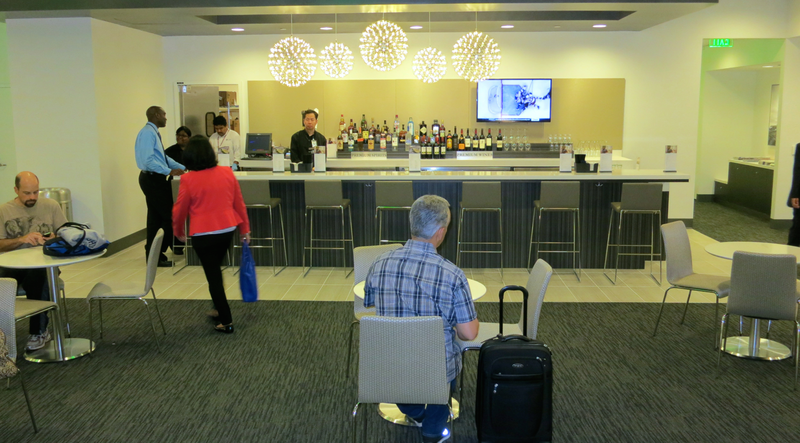 >United Club members now have access to 50 lounges in 39 airports worldwide, including two here at SFO. >Memberships start at $475, but day passes are available for $39 online or $50 at the door. >Clubs offer free wi-fi, beer, wine and liquor, breakfast and afternoon snacks. >United Club members now have access to 25 more lounges that were once Continental Presidents Clubs. >Due to its tight affiliation with Chase, United Clubs will no longer offer free access to American Express Platinum Cardmembers. >United Club already has its own Wikipedia page. >Starting later this year, Emirates passengers will get their own lounge at SFO, and no longer share facilities with United. What’s your favorite United Club location? Why? What do you think of the new name?